I ran twice this week on both Monday and Tuesday nights. There have been some in-world developments. Mt. 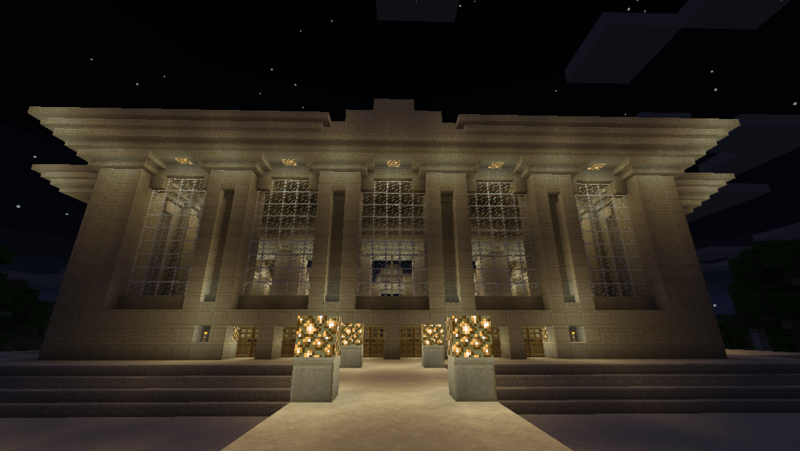 Servermore is now done (now with four faces and seekrit bat cave! 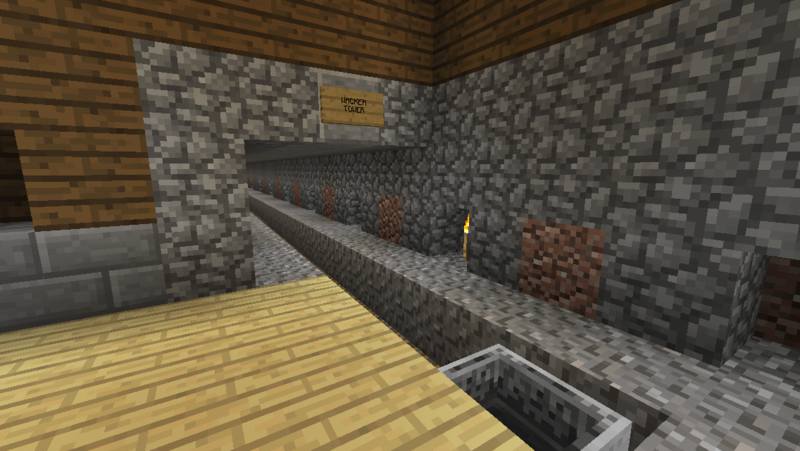 ), as is the Granite line of the subway – well. “Done.” It runs to Wacker Tower and stops there pending expansion. 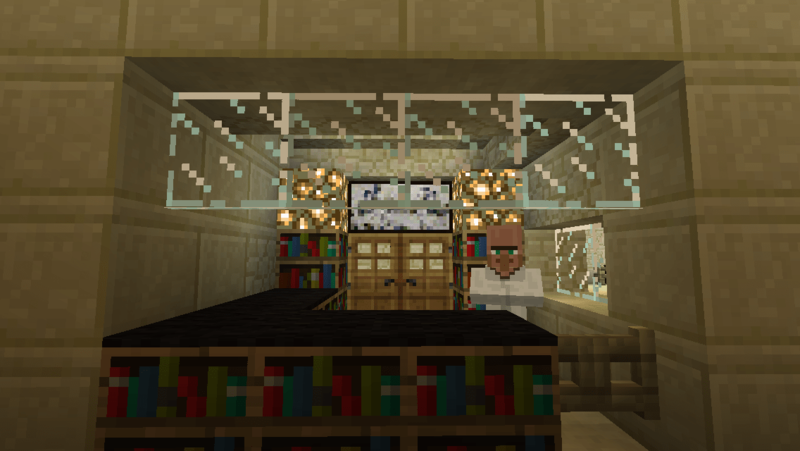 Also during Monday’s game DoublePositive (the artist formerly known as Mathguy04) first showed me and 576875 how to build mostly waterless boat launchers (two exist high in the sky above spawn) and built a steak/leather grinder near spawn house, which is weirdly fascinating. And hey, free leather and meat, right? 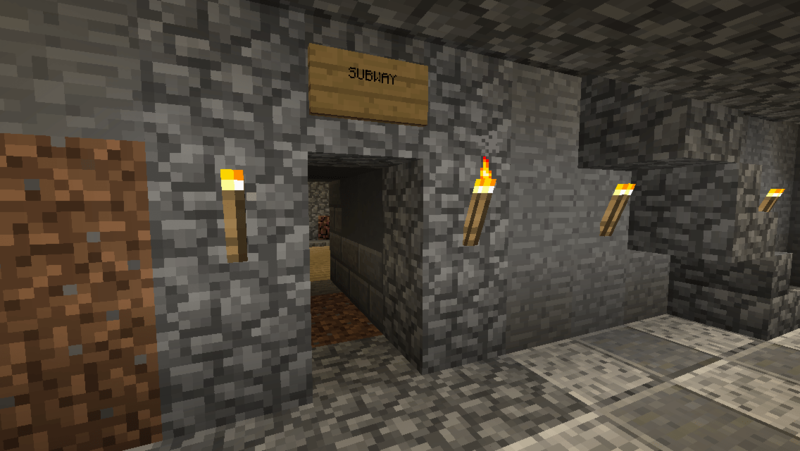 576875 also has built a community mineshaft around the corner from Spawn, so people should feel free to dig around in there during survival games. 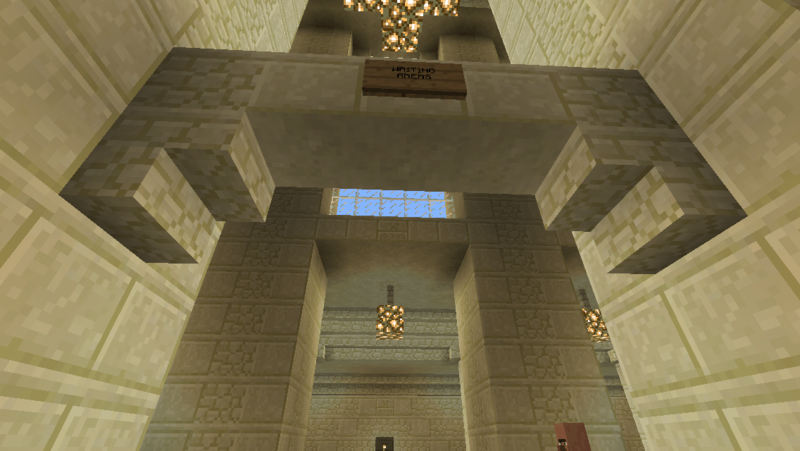 The area around Spawn is about as full as I’d like it to be (more so, but nvm), so I made an official rule calling for a moratorium on building any new structures within 64 blocks of spawn in any direction. I want people to build stuff! 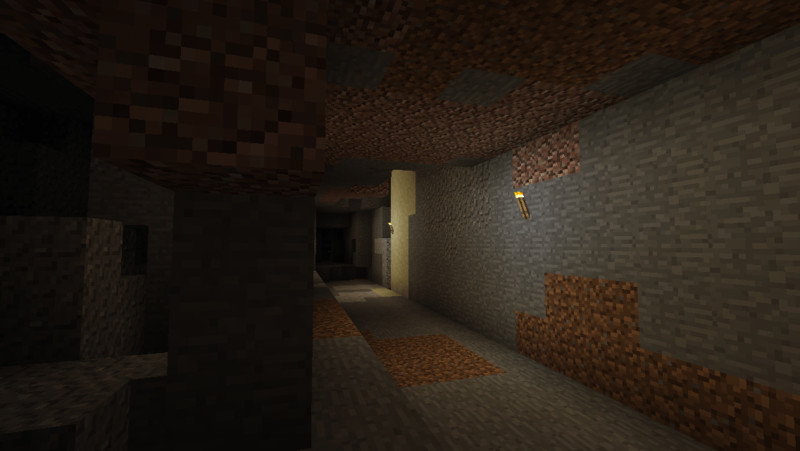 JUST NOT NEAR SPAWN, OKAY. It’s a big world, spread out. 🙂 I made some minor updates to the rule list; please check them out before playing. 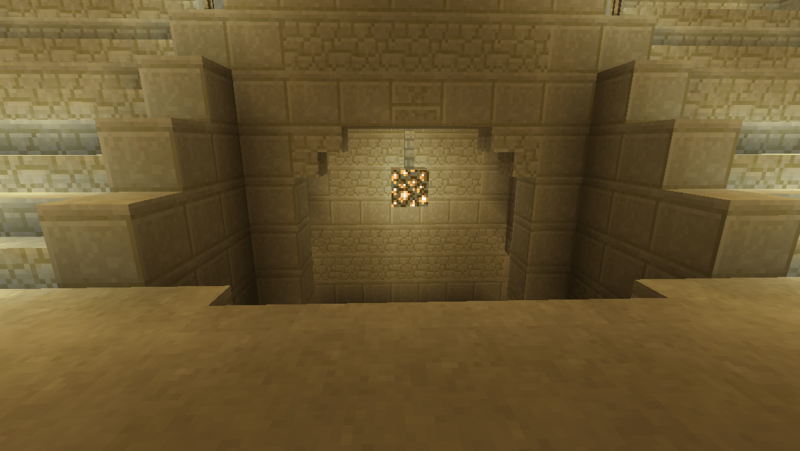 Just for a change of pace, I went down to the southern terminus of the Netherrack line, where there is absolutely nothing aside from a “budder” house Beastie built at some point, took a hard left onto an adjacent landmass, and switched the game into survival. Aside from the flights to and from the main continent, I’ve been playing pure survival at max difficulty in this area. 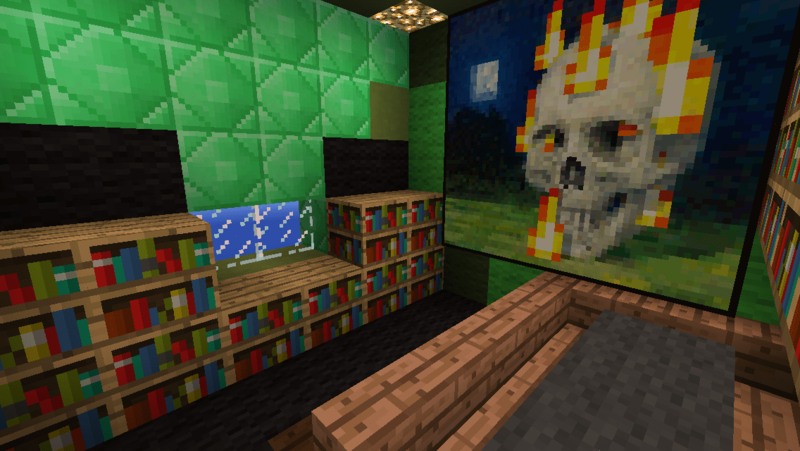 I’d been stuck in Creative mode for so long that I’d forgotten what a challenge resource management and staying alive is, especially as my little island home seems to be absolutely plagued with creepers. >_< It’s a nice break from everything else though. Ah, nothing like the first week after a major update drops. It’s like having a picnic next to a frog pond – so many bugs, lol. My main annoyance is that Plug PE is totally borked after the update. 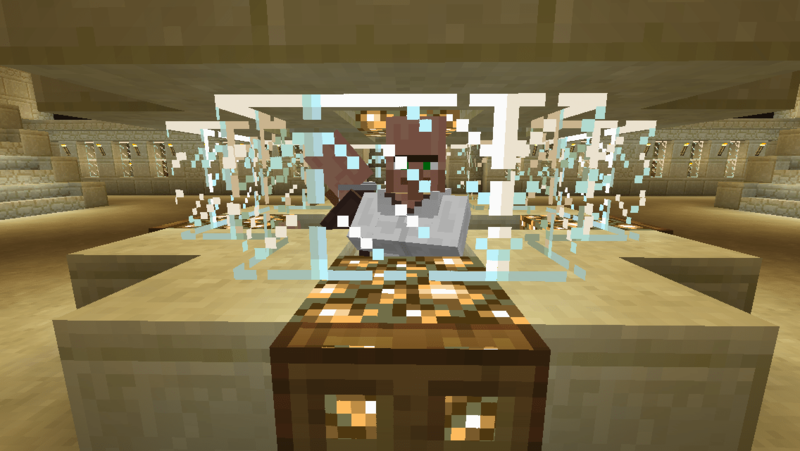 There has been an update this weekend which restored some functionality like coordinates, but due to some incompatibility with 0.11.x they had to remove teleporting. Ah well. Back to taking the long way places. Didn’t much matter anyway as plug repeatedly crashed out while running game to the point where I just gave up and quit trying to run it. I do hope that gets fixed soon. Two more bugs that are making server runs a right pain is 1) a lot of times other players spawn in what appears to be the void (really just the terrain not loading in right away) with a really jittery, shakey view of the sky. People playing tonight disconnected, reconnected, couldn’t really get on and tried again for most of the night. 😛 Also I’m apparently invisible to some users. Gonna have to ask the Reddit crew what devices they’re using, as I suspect maybe a platform issue or a skin compatibility problem or something. Aside from those irritating bits, it was a fun and productive run. 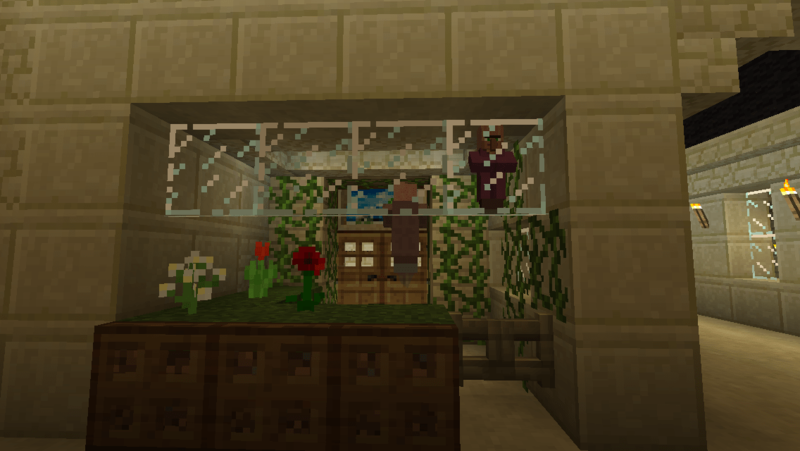 Two new folk to the server today: welcome Henry10030 and pedro! Please stop by again. 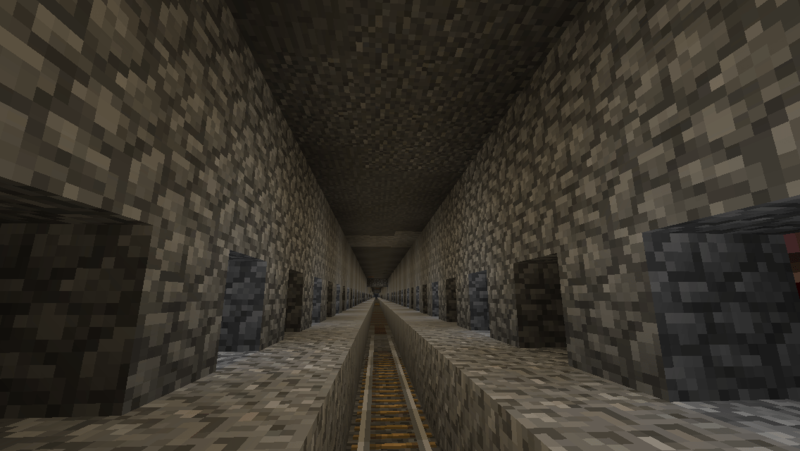 In world development news, I’ve finished as much of the Granite Line of the subway as I’m going to bother doing until I start building stuff out east. As it is, it terminates at Wacker Tower. 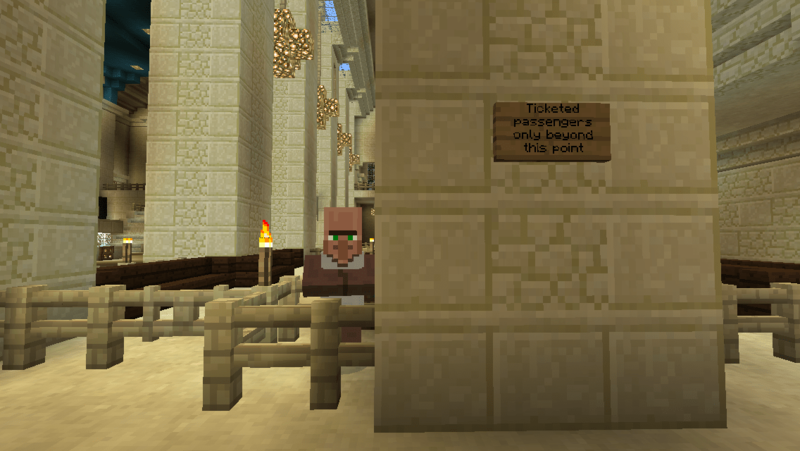 Also looks like the Brick Line may terminate at Mt. 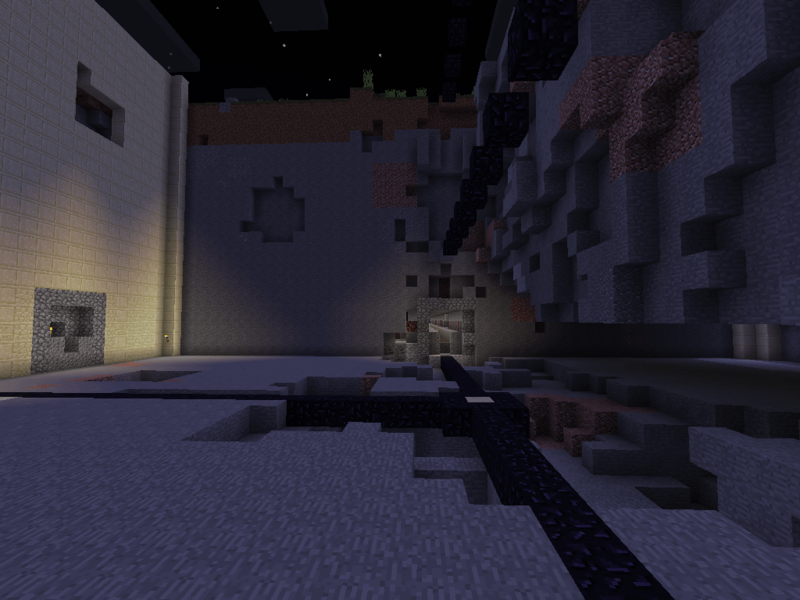 Servermore, which is coming along both in the faces and in the “mountain” I’m terraforming around it. I’ve been taking pictures of stuff, other players, and myself doing things because yay new skin. I’ll post those soon. 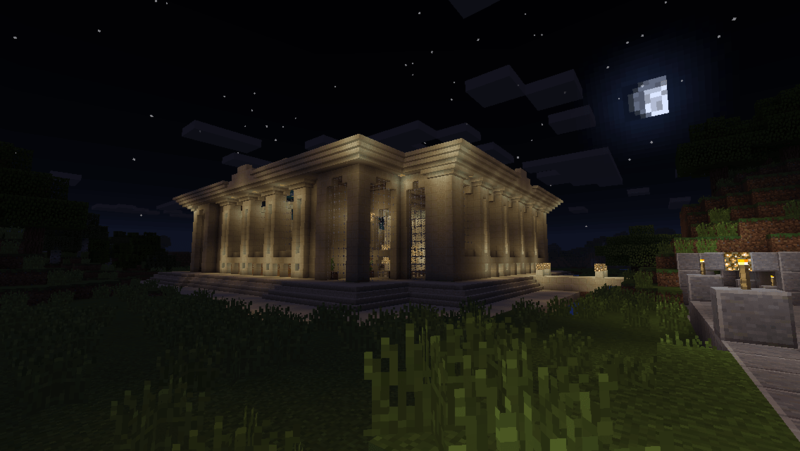 Yep, just another evening in the world of Minecraft. I kinda fell off the face of the earth in terms of updating various blogs and journals. Sometimes real life (and chronic illness, unfortunately) catches up with me. 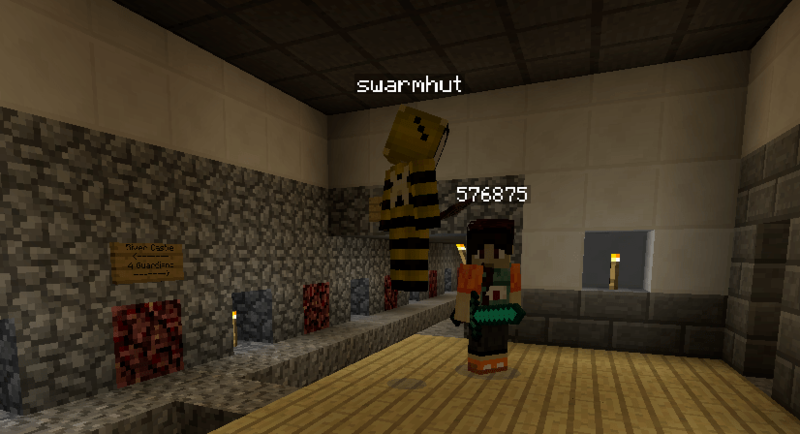 I want to post on Monday’s server run (it was quiet due to problems with new settings in the updated Plug PE) and take pics of the various things 576875 and Swarmhut have been building. I’ll get around to those posts at some point, but here’s the big exciting news – aside from retail spaces and the food court 576875 is building on the mezzanine, Grand Central is finished! 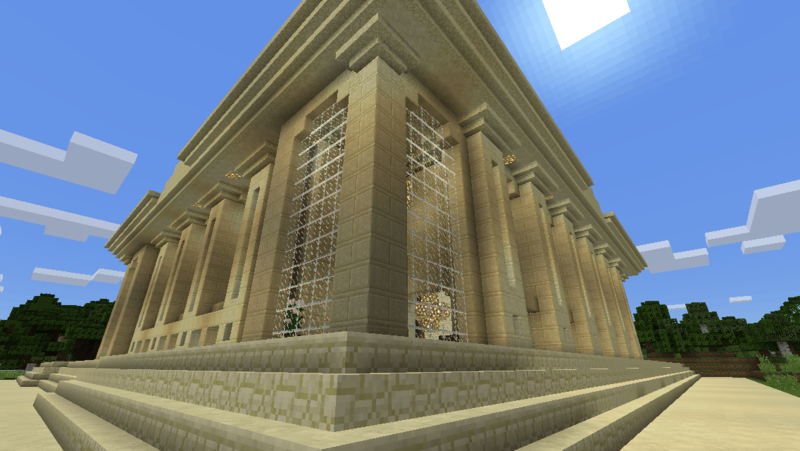 It’s going to be a very very VERY long time until I work with any kind of sandstone again, lol. 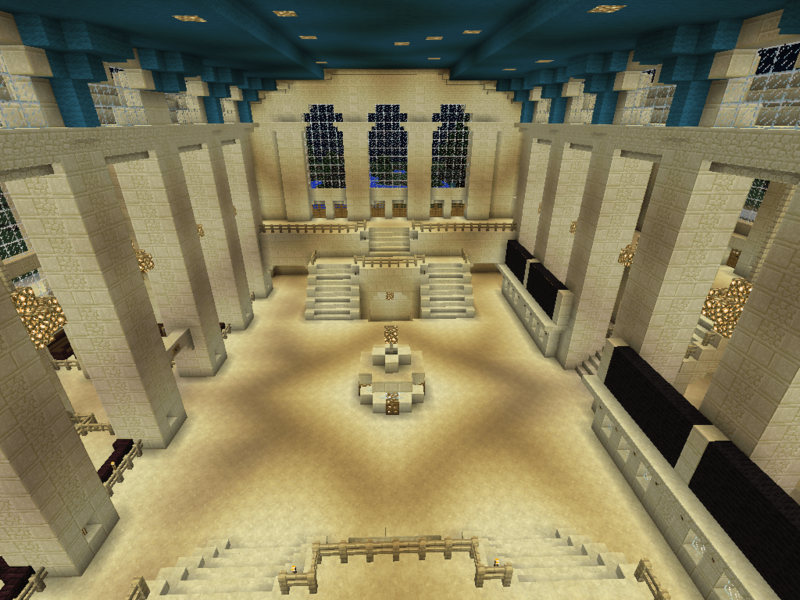 Several weeks of a big build using nothing but and I am thoroughly sick of looking at it. 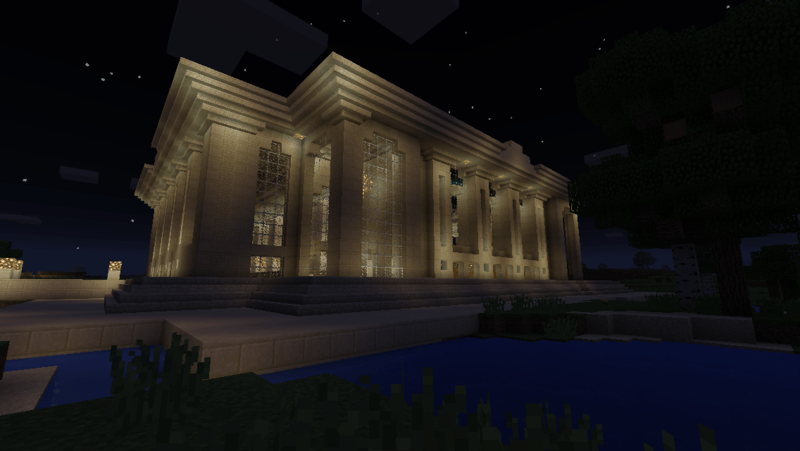 Still, I’m really proud of this build, it came out awesome and even though I have a few problems with the final build (mostly aesthetic stuff)… yeah. But enough blather. PICTURES. There are many. The Terminal from the road. So in preparation for boats, I dug some small canals around the station so that it wouldn’t entirely block off the river surrounding it on three sides. I honestly should have built one straight across on the north side. Might still. Looking at the station from the North. 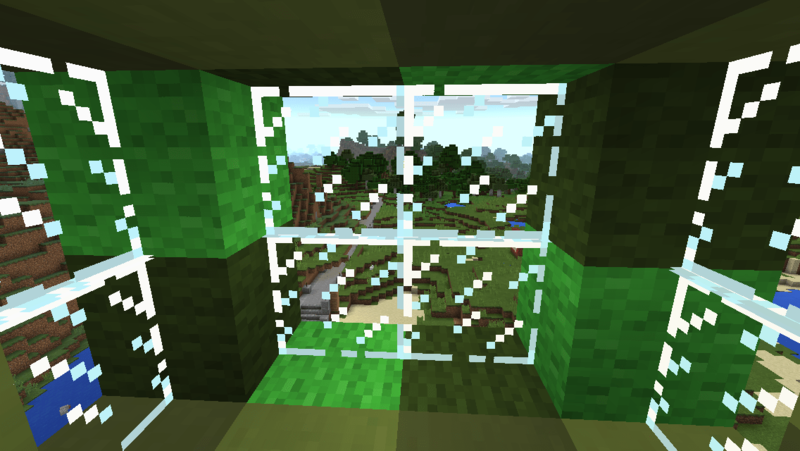 Peeking in from the North windows. 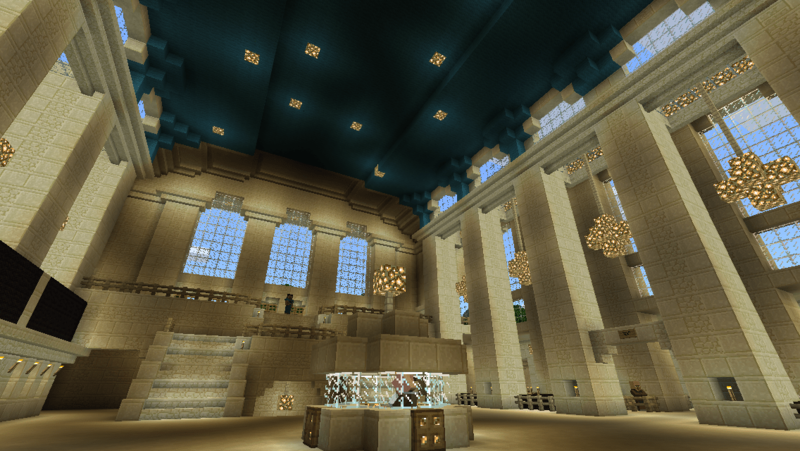 I took lots of pictures inside the Grand Concourse. Mostly from similar angles, oops. I sort of made Orion and then put more “stars” around him. Looking East from the roof. I like the pattern of light here. One of the corner antechambers. 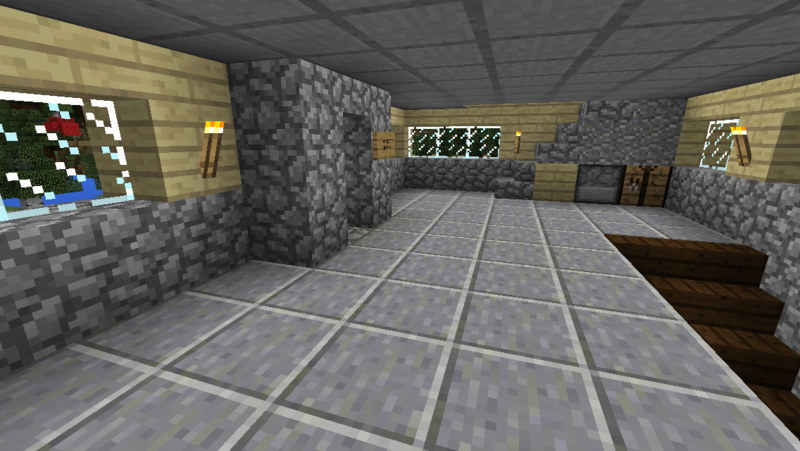 I’m not sure what to do with these rooms in the corners. 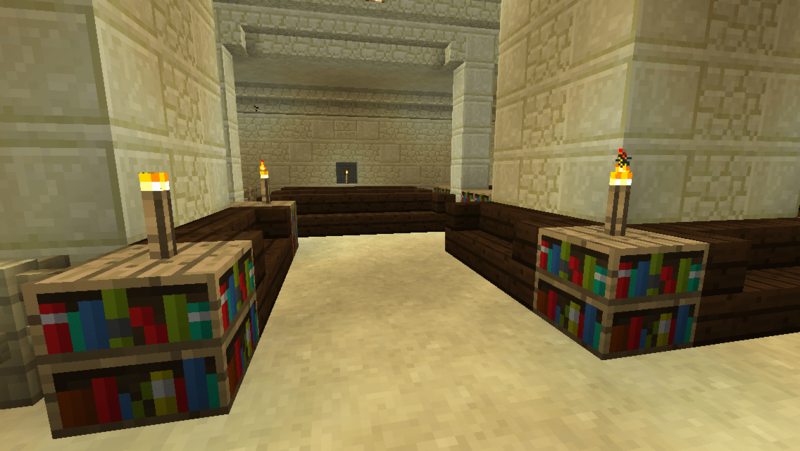 Maybe additional reading/waiting space? Think that sign needs to come down a block. 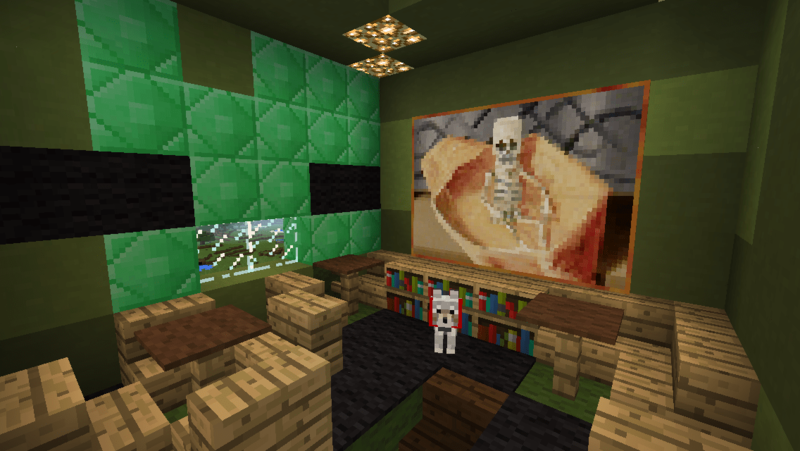 The waiting room looks comfy. 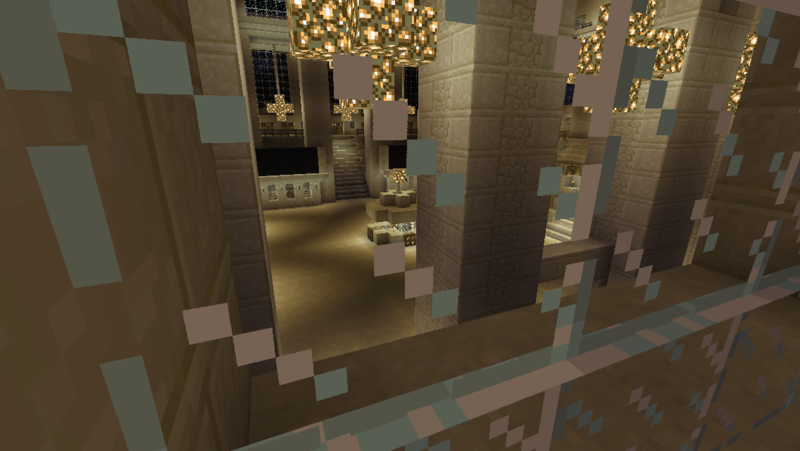 I haven’t managed to do much in terms of retail space (the real Grand Central is packed with shops), but there are at least four spaces under the grand staircases that I’ve managed to do things with. some delicious cake for sale. No one seems to be here. A book for your journey perhaps? A quick peek downstairs to see what 576875 has been up to. 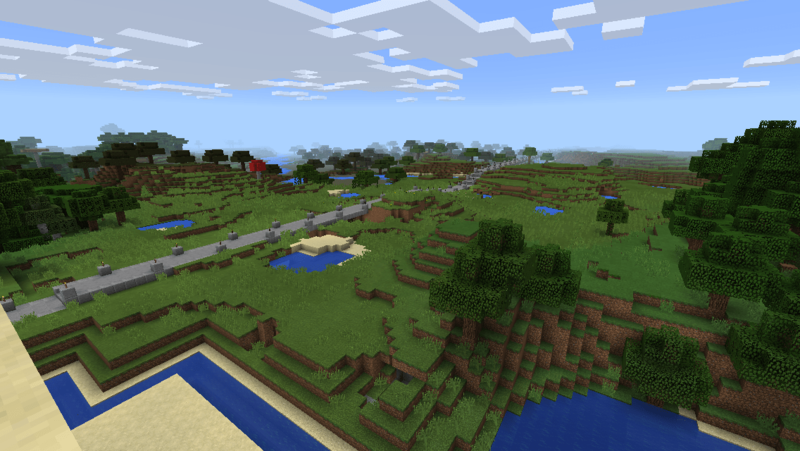 Finally my favorite thing – stand on the roof of whatever I’ve built, batman style, and enjoy the view around it. The road rambles on in the distance. So yeah, there you have it. 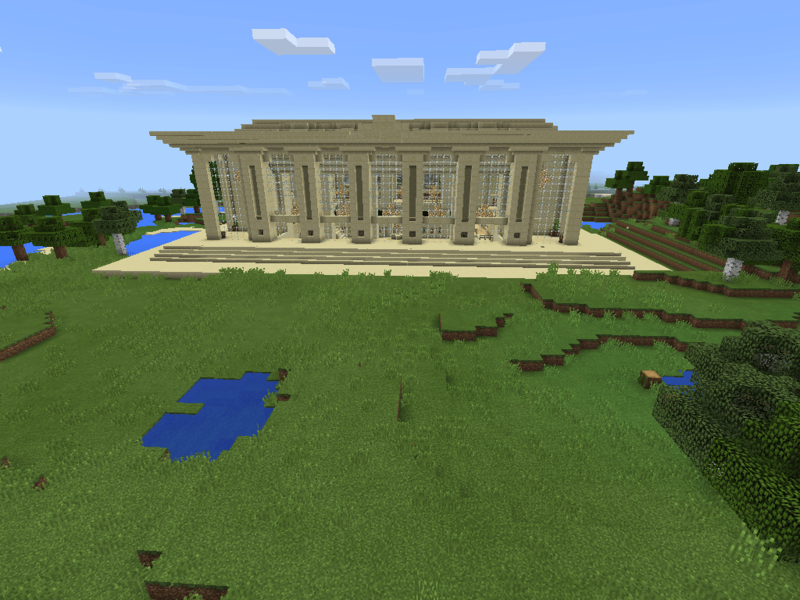 And now I have a tiny chunk of home in my minecraft world. 🙂 I suppose I ought to get cracking on expanding the subway in its various directions, lol. Soon. 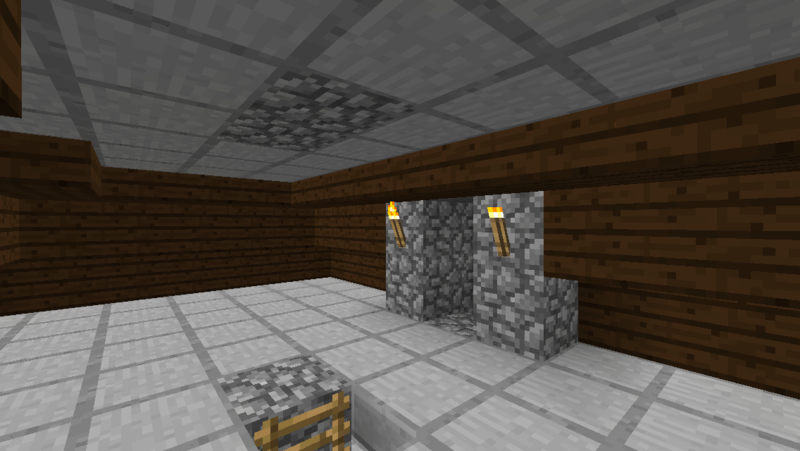 …well okay, when there aren’t huge holes in the floor/wall. 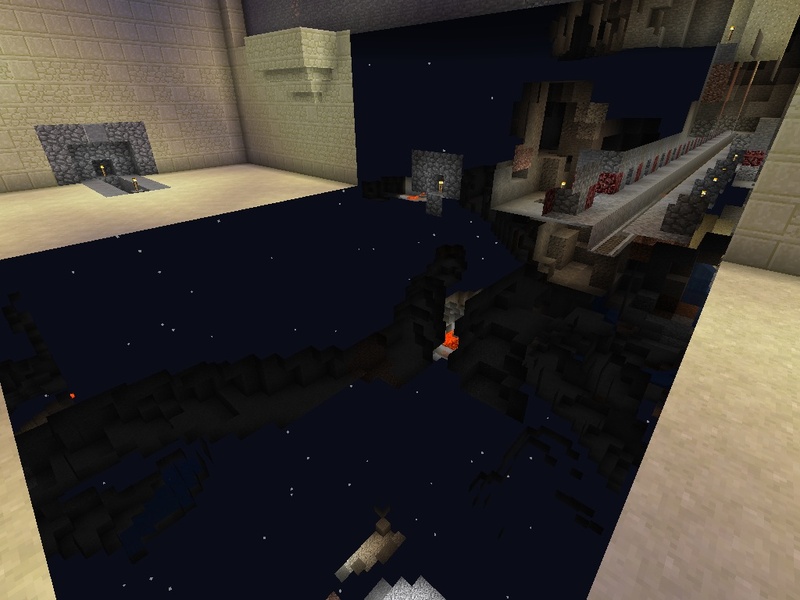 Also there is apparently a HUGE cave system under the south tracks. Going to have to investigate that later. track level from the corner. Time to do the next story! 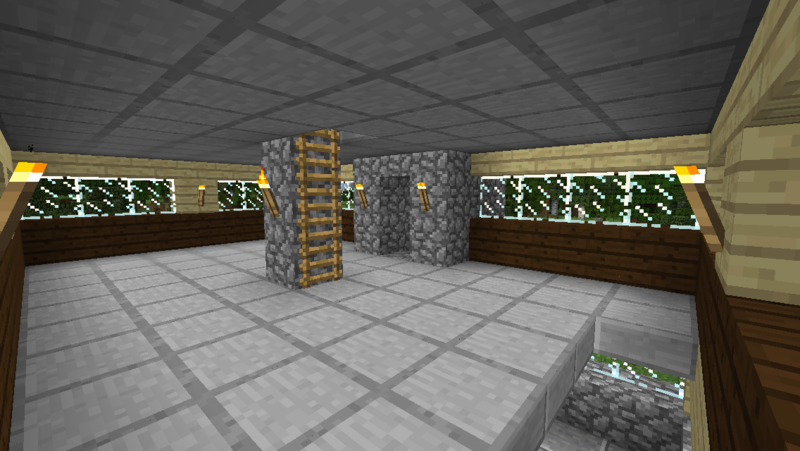 I’ve since finished up the mezzanine level. 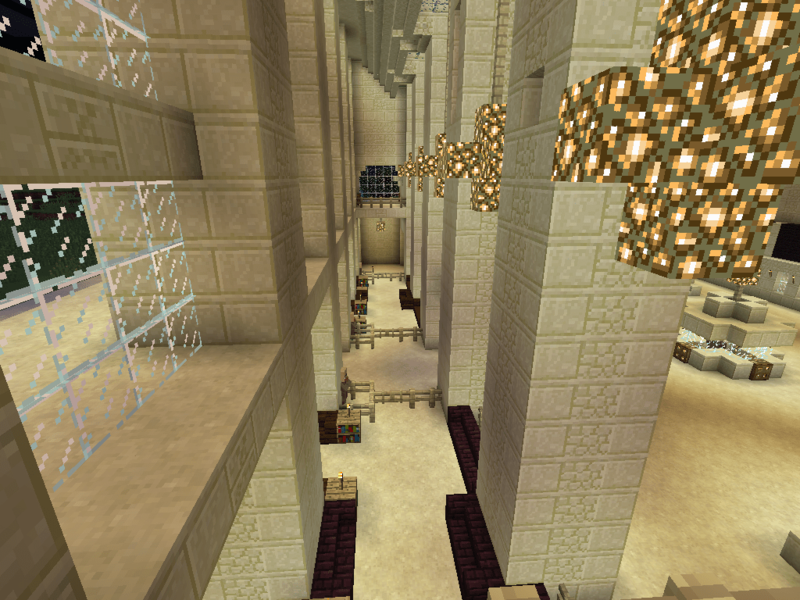 The center column of the mezzanine level. Mezzanine staircases going both up and down. It’s currently a big empty room bracketed by the two staircases on either side. 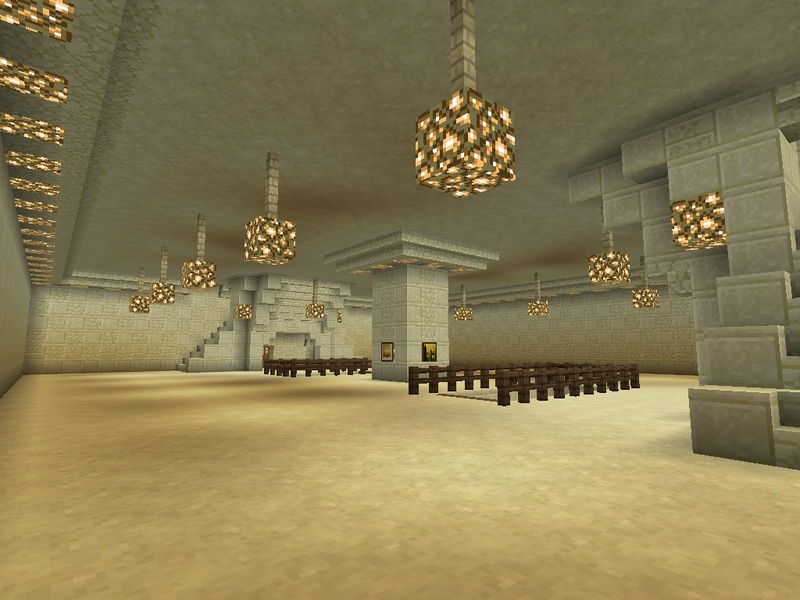 I may put in some vendor booths and cafe tables later. The real station has a fancy food court and a branch of the NYC transit museum on this level. I’m still working on the main level but so far it looks awesome. 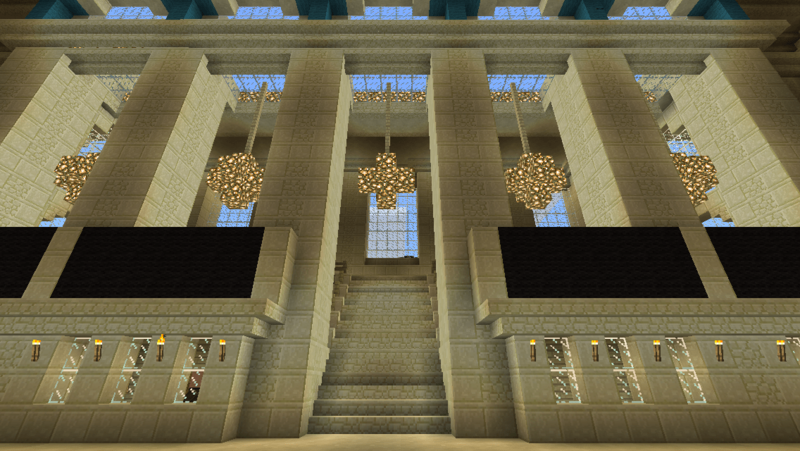 The grand staircases were annoying to design and build, and I ended up trying three different things before settling on this, and then I had to build it from scratch an extra time since I had a game crash and none of the work I’d done that afternoon saved. D’oh! 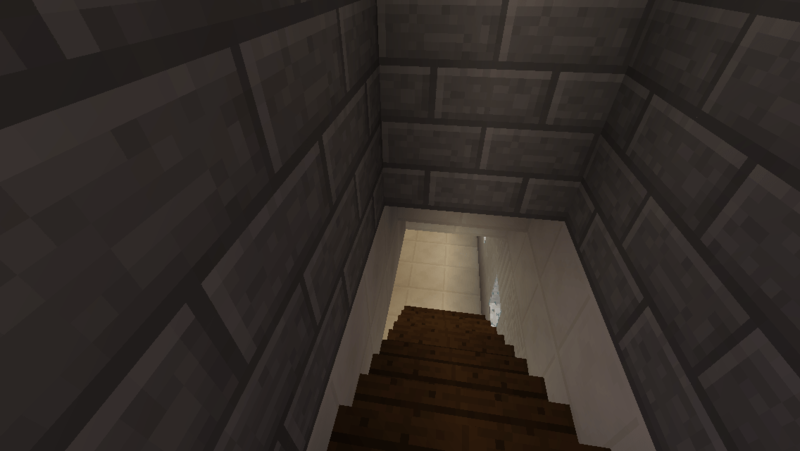 Honestly I should have known the game was a little screwy – I cam up to work on one of the starcases to find that all of the stairs I’d put down had oriented themselves facing north. Thats a weird looking glitch. 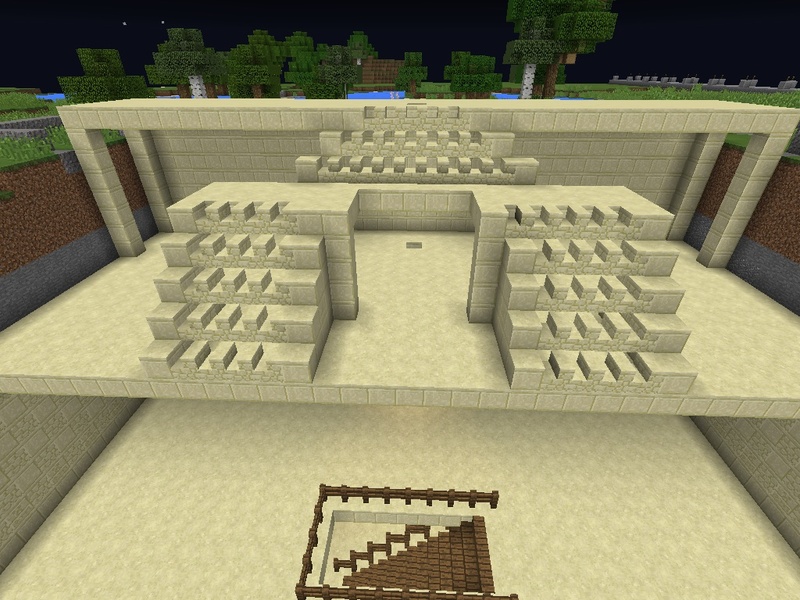 I didn’t get a picture but some of the stairs I’d placed upside down in places had also turned themselves around. It was a little creepy looking I won’t lie. But then the game crashed and I had to start over, but the nice thing about having to build a thing twice is that you’ve already worked out the kinks so it goes a lot faster the second time around. 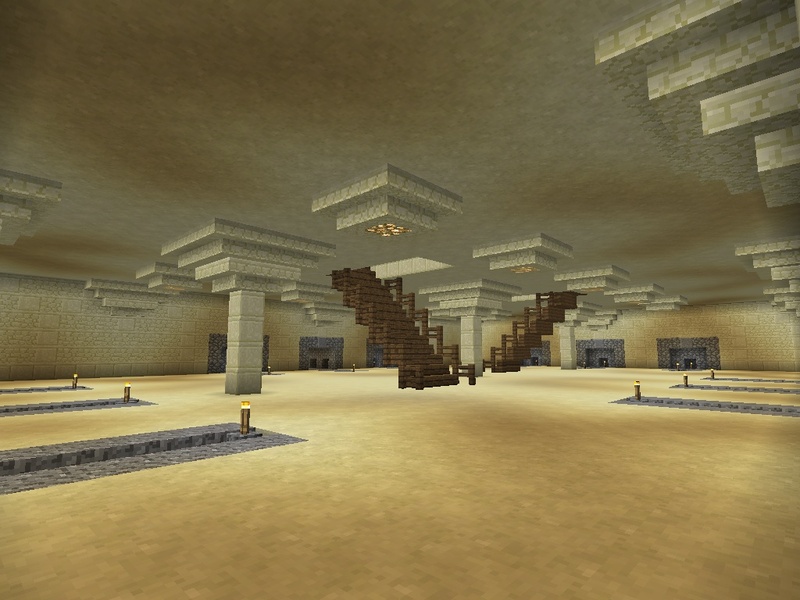 This is just the top of the staircases down to Mezzanine level. 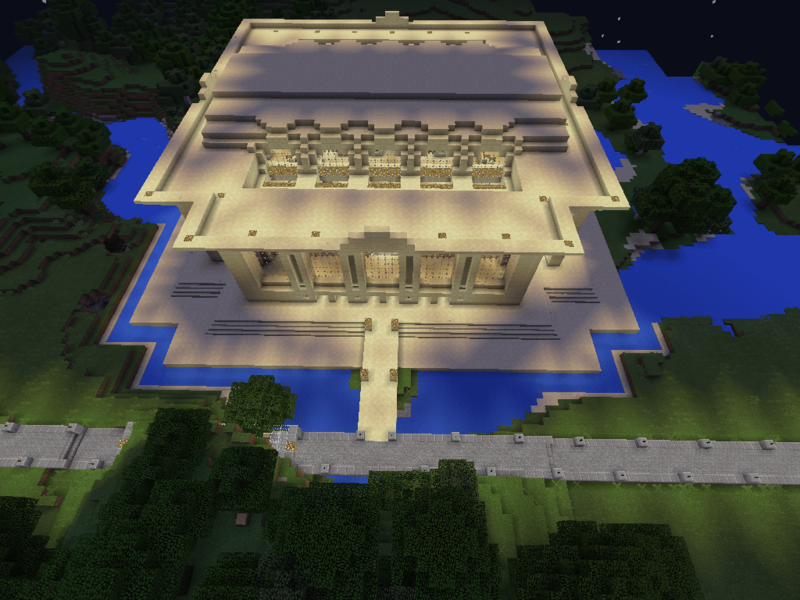 So, yeah, it’s coming along. Maybe a little slower than I’d like, but I’d been busy this week with other stuff. 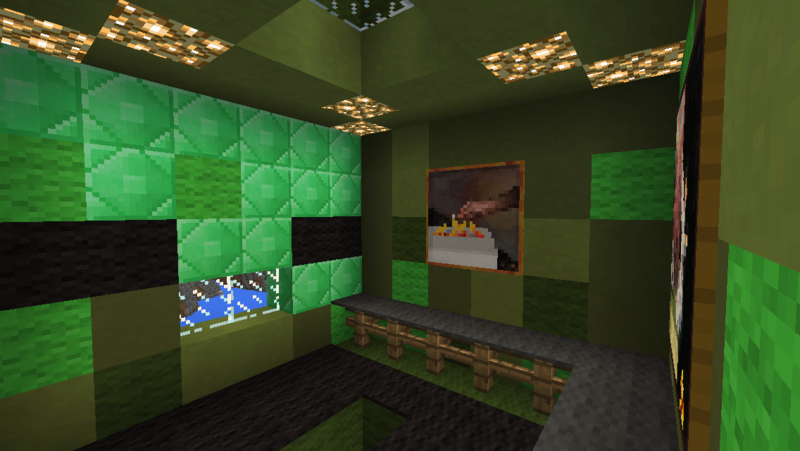 I realized earlier that I hadn’t made my post-open-server post this week, so I’ll just take this moment to thank The_Swarm_Hut, Mathguy40, 576875, and Brandonthekid-don’t-remember-your-reddit-handle-lol for coming. 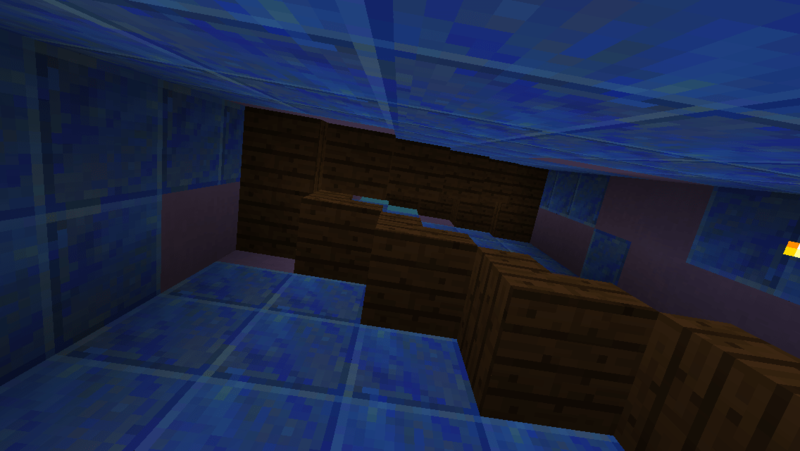 5’s underwater surprise seems to be coming along, while The_Swarm_Hut built a bunch of neat stuff by spawn. 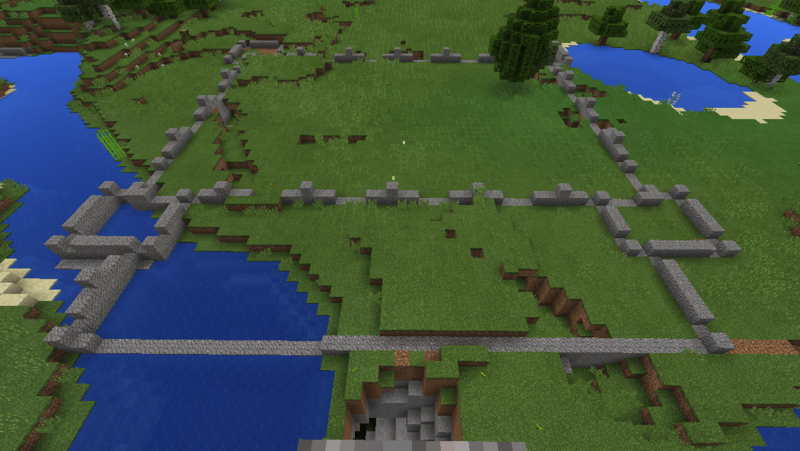 I’ll probably make a separate post about this tomorrow, but I’ma need folks to start ranging a bit away from spawn for building stuff – the area by Spawn House is filling up quite a bit. 🙂 But yeah, it was a good open server night, and being able to play with friendly company was nice after a long and unfortunately crappy day beforehand. I will be running tomorrow night at 6, hope to see folks there. 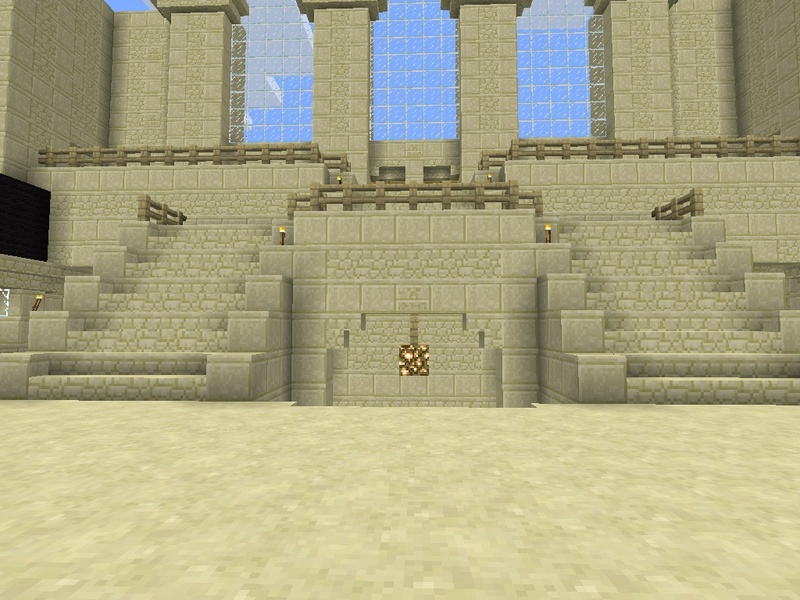 I feel a little bad starting a completely new build when I’m still technically not finished with Bad Joke Prison (I’ll explain it when I post about it), or a lot of the last little fiddly details of Wilshire castle or Sand Baori, though they look awesome as is and I shouldn’t stress about it. 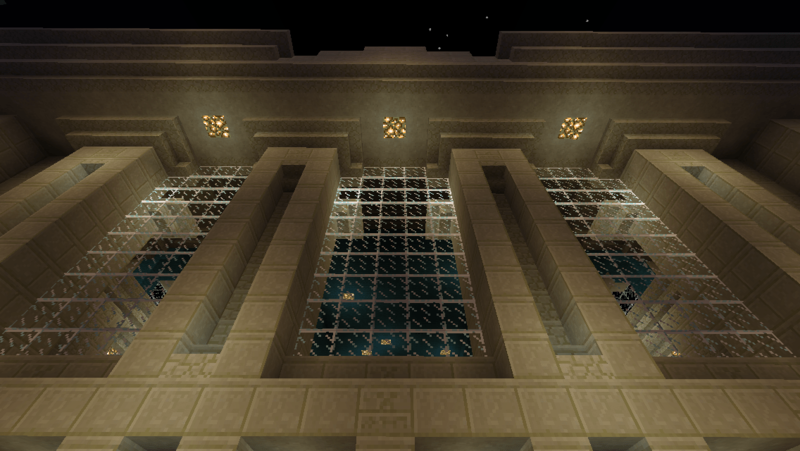 I mean when you really get down to it there some detail work I haven’t finished on the Crystal Palace. and that was months ago. I’m really excited about this build though, and after my nerdrage of last week, plus some real life Stuff Happening, things to get excited about = win. This is a multi-layered challenge for me. 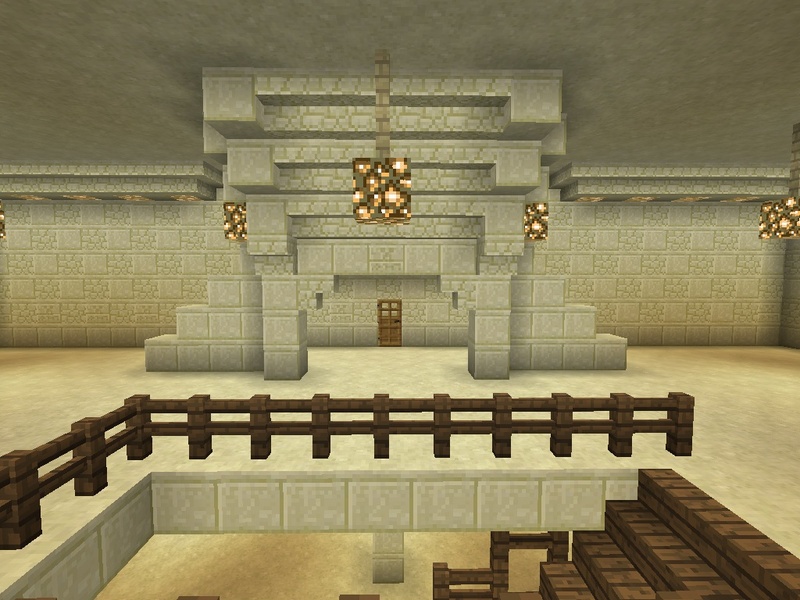 One, this is the first time I’m building something based on a place I’ve actually been, as opposed to seeing a picture of somewhere and thinking “ooh, that looks cool” and building something with a LOT of imagination and creative license filling the gaps. Not only that, this is one of my favorite places on earth. 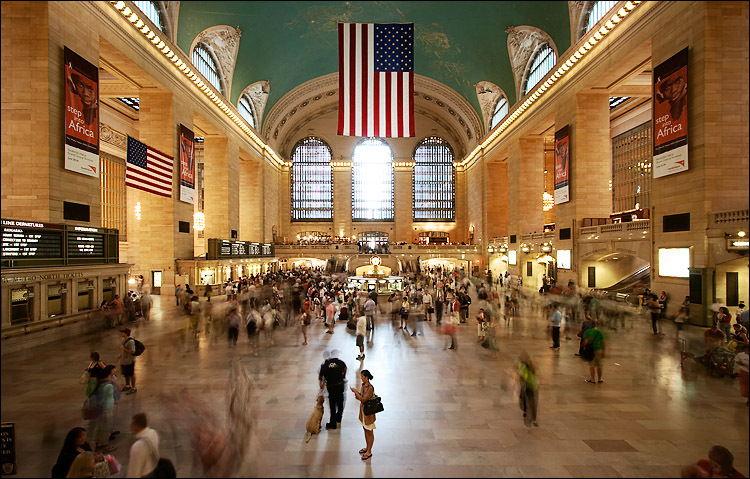 To a native New Yorker who is also mad for all things having to do with railed transport, Grand Central is like… you know what, there aren’t even words. I guess the closest I would come up with is a devout Catholic getting to visit the Vatican. So there’s an emotional component in this build. This isn’t to say there won’t be creative license taken with it – it’s not going to be a dead accurate model by a long shot – but I hope to capture the feel, the grandness, if you will, of this train station by the time I’m done. But before I get into how I’m doing with that so far, a common question from people visiting my open runs is “how the heck did you build this subway and how long did it take you?” I usually answer something along the lines of “in sections, and for-freaking-ever,” but since I had to expand the tract from its former northern terminus at Wilshire Castle on up to the GCT site, I figured I’d try documenting the process a little. I will note that building said subway expansion is a crapton easier now that Plug gives me coordinates. Now that I know the extant subway runs at (x, 42, -3), all I have to do is line up x. Lets say Point A is where the existing subway ends and point B is where the new station/end/next build will be. 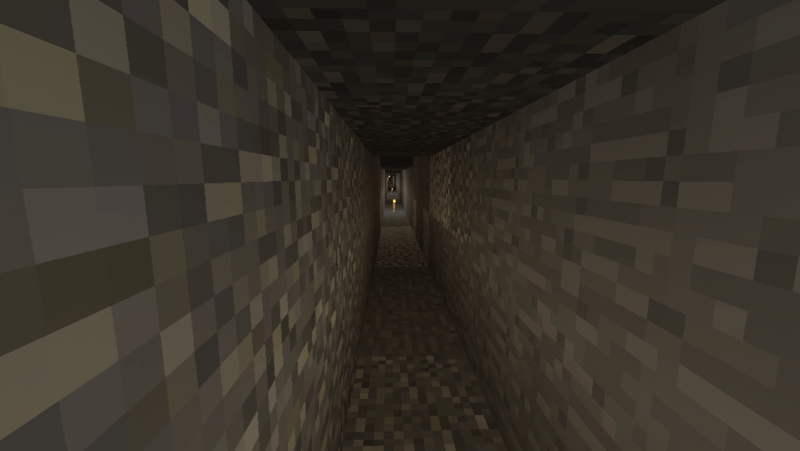 The first thing I do is dig a 1×2 tunnel all the way end to end. 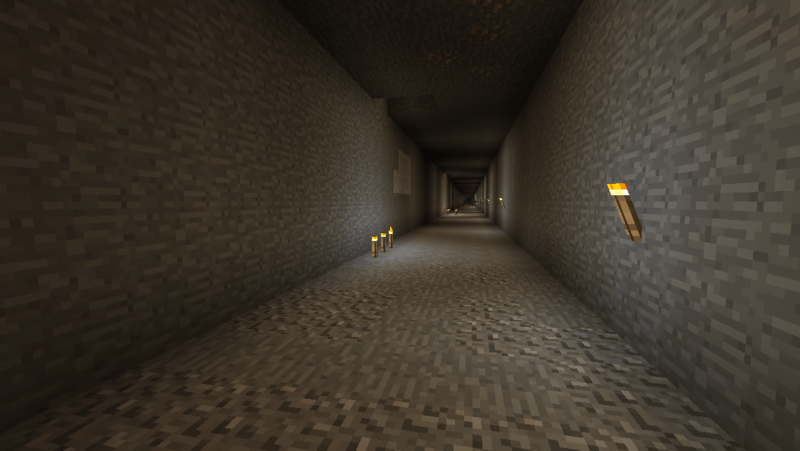 what the initial tunnel looks like from point B.
also bad if 2 block high spaces trigger claustrophobia. 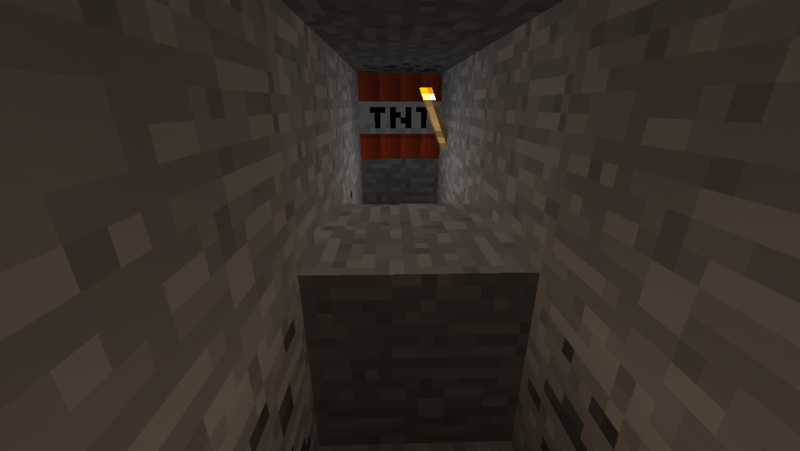 Pro-tip: do not place TNT on cobble fences. Tedious as it is the fun part is if you do this correctly, you light the TNT at one end and then it just keeps going off in thin this lovely chain of explodey all the way to the other end. It’s kind of hilarious because it only goes so far as the couple of chunks you can see, and then you walk forward a few minutes later and OH NO MORE SPLODE. It’s pretty glorious. But then the funs over and you have detritus to clean up. Ugh. we’re gonna need a few more pickaxes. If you’re in creative mode, this is where “bulldozing” comes in handy, especially if a) you’re flying b) you have blocks above you to clear. Get your face level with the line of blocks you want to clean out, then tap and hold. You’ll dig out the six blocks in front of you and then stop. Keep holding, but hit the forward arrow at the same time. Watch the blocks in front zip apart as fast as you can fly at them. Makes things a lot less tedious. 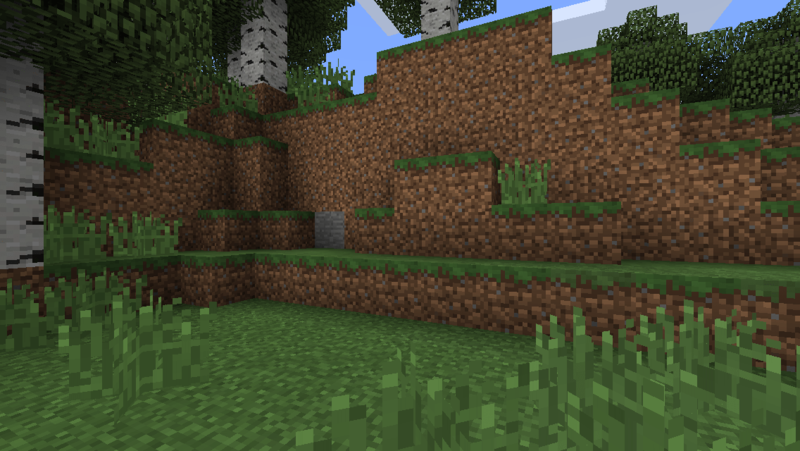 It does also work with blocks directly in front of you on the ground, but you do run the risk of jumping if you don’t time it right. Still – practice! 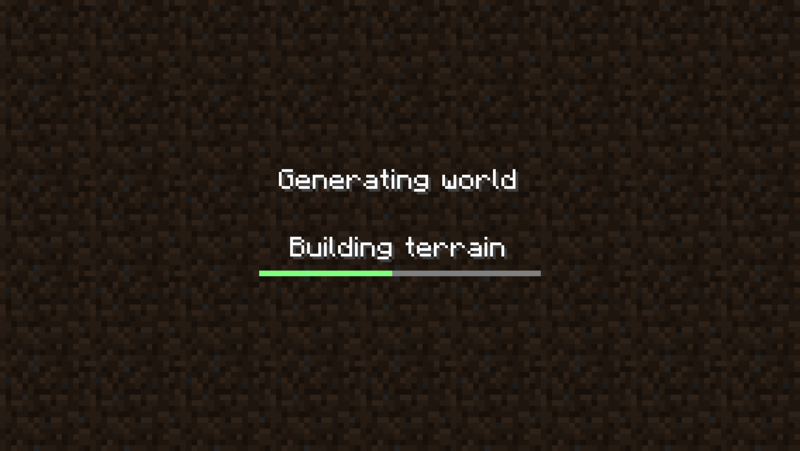 Anything that makes clearing a large number of block faster = win. 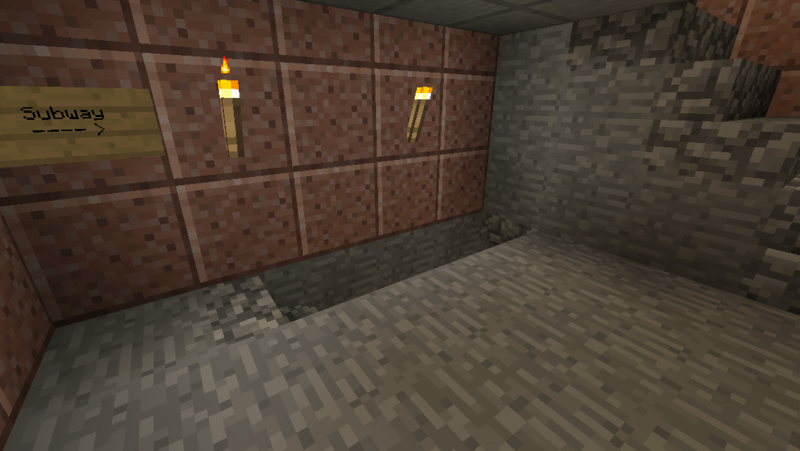 I dig out a five block high by five across square for my subway, and then line it with cobblestone on the top and sides. The bottom gets gravel in a 3×2 U formation, with the track running in the groove in the middle. 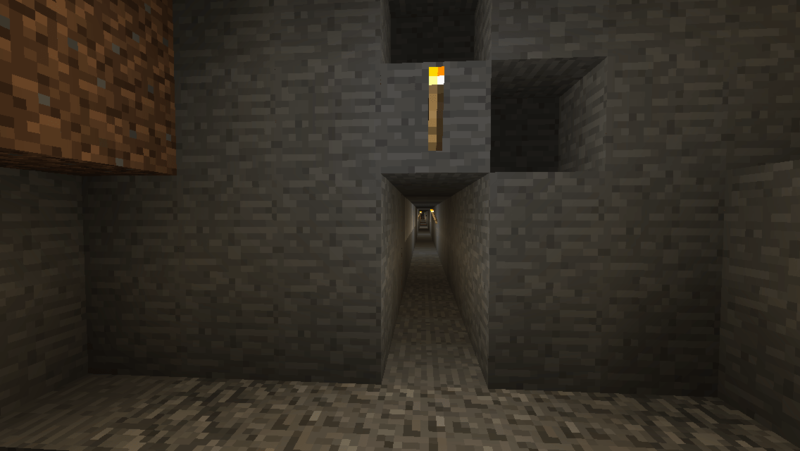 But before I start slinging cobble around I end up with these cavernous long square holes that call to mind the giant water tunnels running waaaaaaaaaaaaaaaaaaaaaaay below Manhattan. Go look em up sometime. a long cuboid to nowhere. 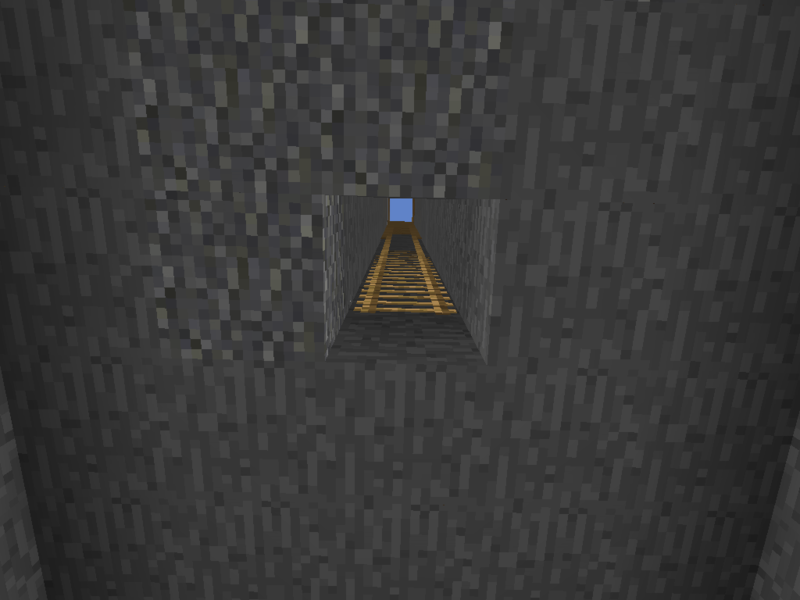 Well now I have a tunnel, now what? Dig out a line of holes on either side? Why would I do that? Wait no actually I AM doing that. No real practical reason besides aesthetics. 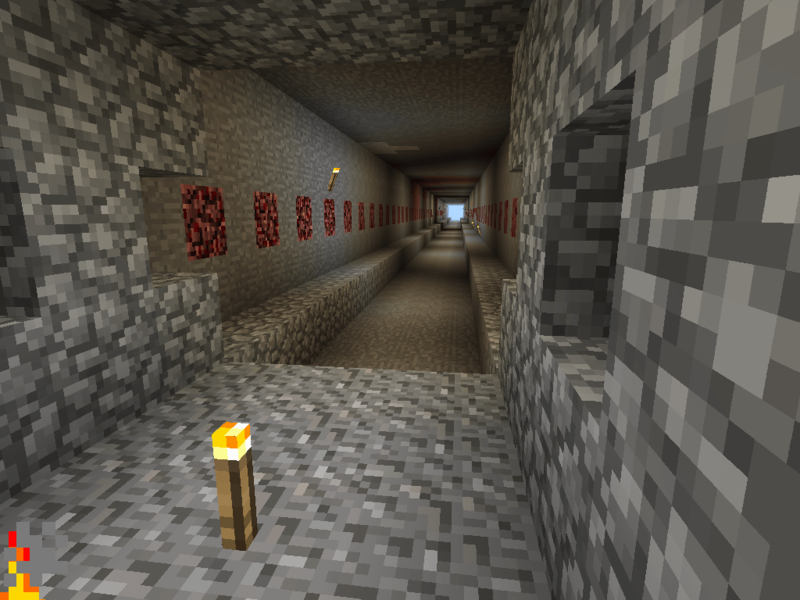 I put netherrack in those spots so that the tunnel walls have a little color. It makes more sense in the next shot. 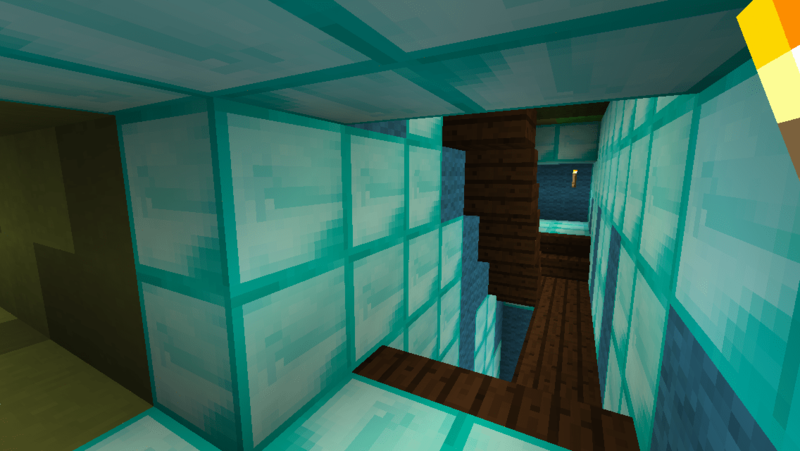 Also about every 64 blocks or so, there’s a shaft with a ladder up to the surface. hey there is sky up there! I used to need to dig these up so I could figure out where the hell I was. 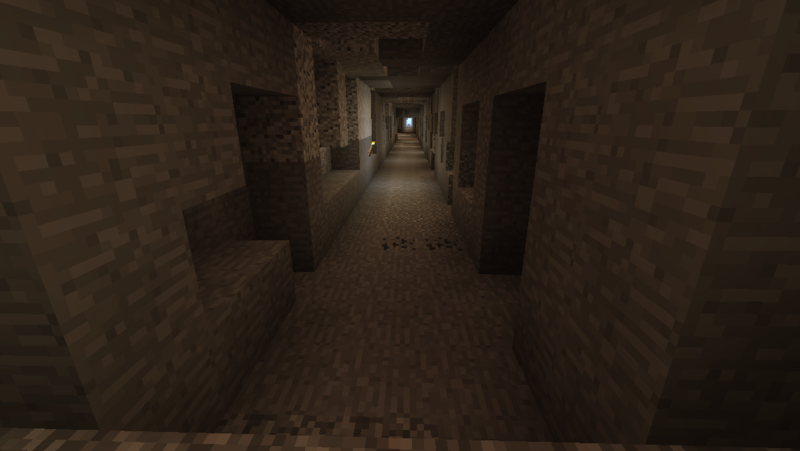 Also it proved handy sometimes to have a periodic access point to the train tunnel below from the surface. Slightly less handy from the tunnels, but still possible if you have a couple of blocks and a couple of extension ladders with you. 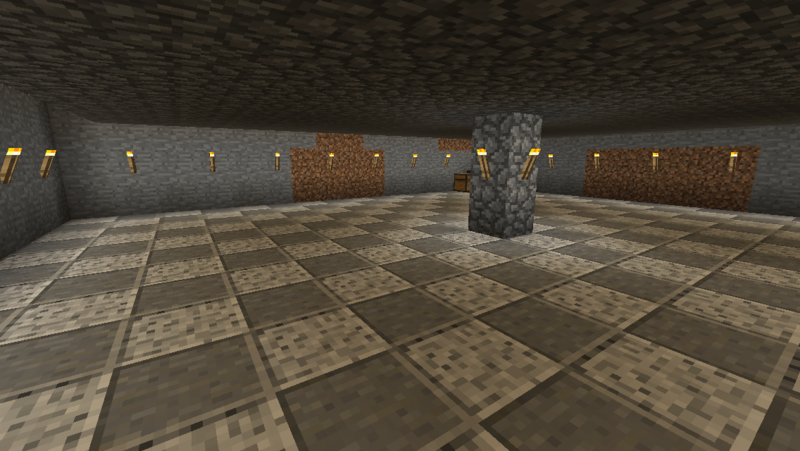 Most of the rest of the tunnel construction is just more running back and forth laying down cobblestone, gravel, rail, alternating patterns of torches and netherrack, and it’s all very tedious grunt work at this point. 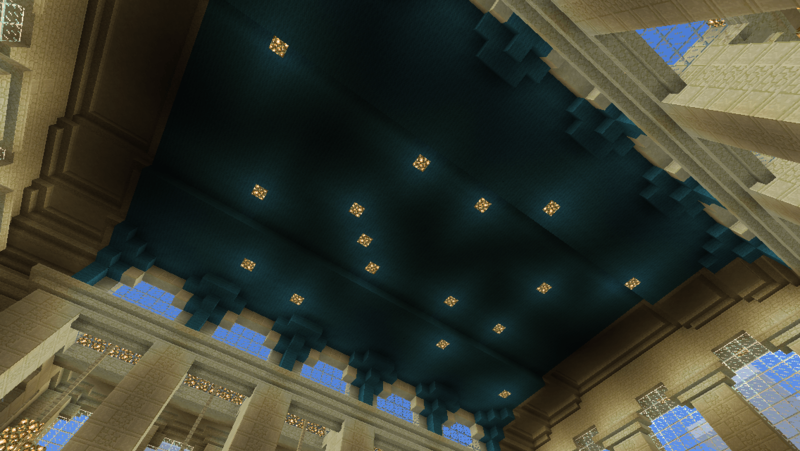 Almost done, just gotta do the ceiling. 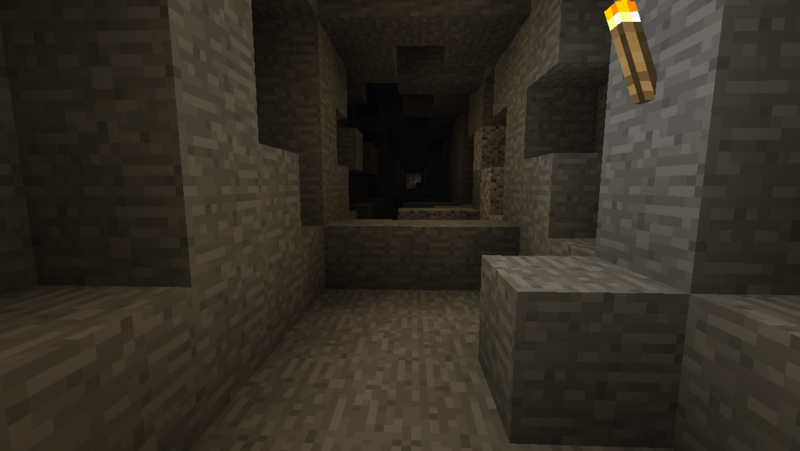 one thing that does liven things up is that digging out subway tunnels you will inevitably cross paths with a wandering cave or three. 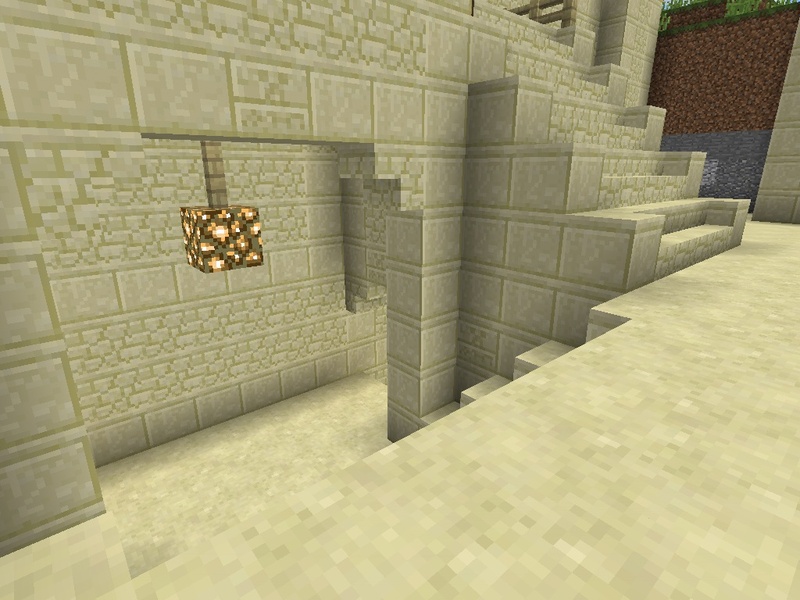 I don’t seal these intersections usually, it’s more fun to leave access to caves open for later exploration. 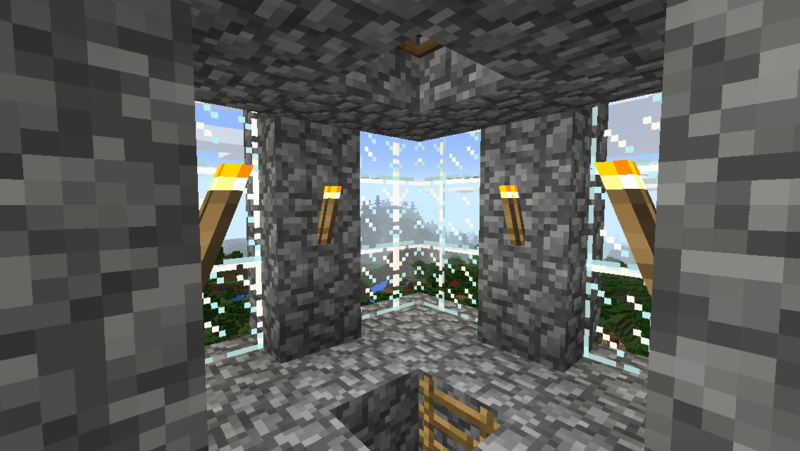 If the cave is mostly above the tunnel, I glass in the ceiling instead of using cobblestone so you can see up as you pass. 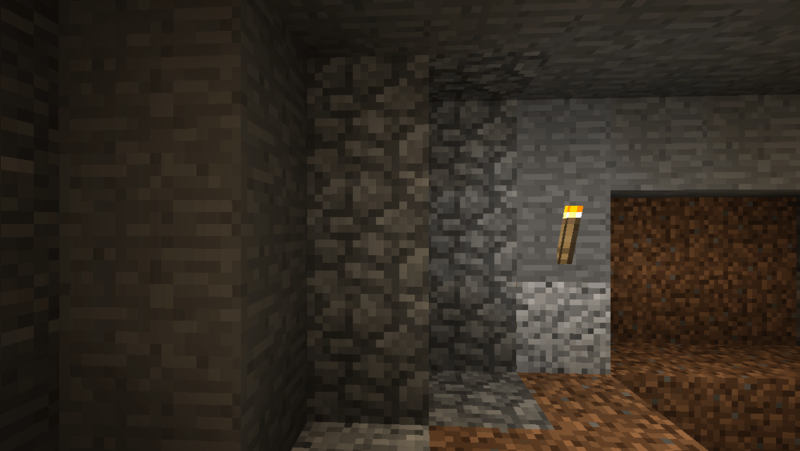 Occasionally this leads to random discoveries, like hey, I’ve never been in this cave before why is that wall randomly cobblestone? There is nothing suspicious about this wall, nor about the moaning behind it. We’ll have to come back and investigate that at some point. And then you pull out the explosive stuff. clearing out that sizable of a space requires quite a bit of both controlled detonation and “lets pack a 7×7 space full of TNT and see what happens” sort of detonation. still clearing out the rock. 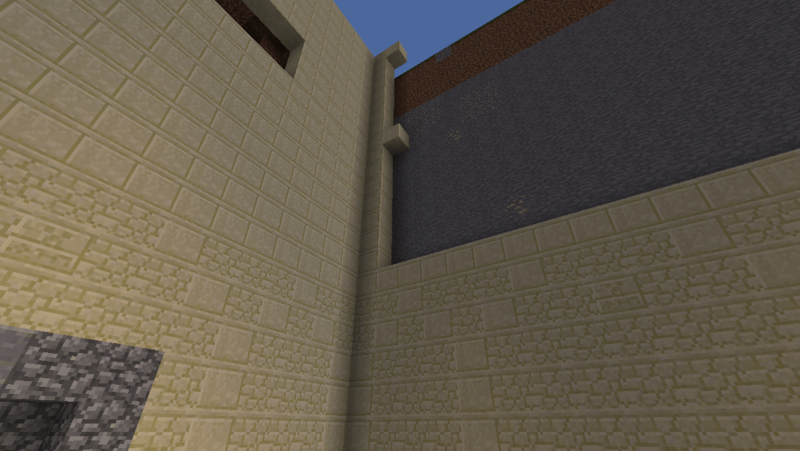 And occasionally putting up single walls. 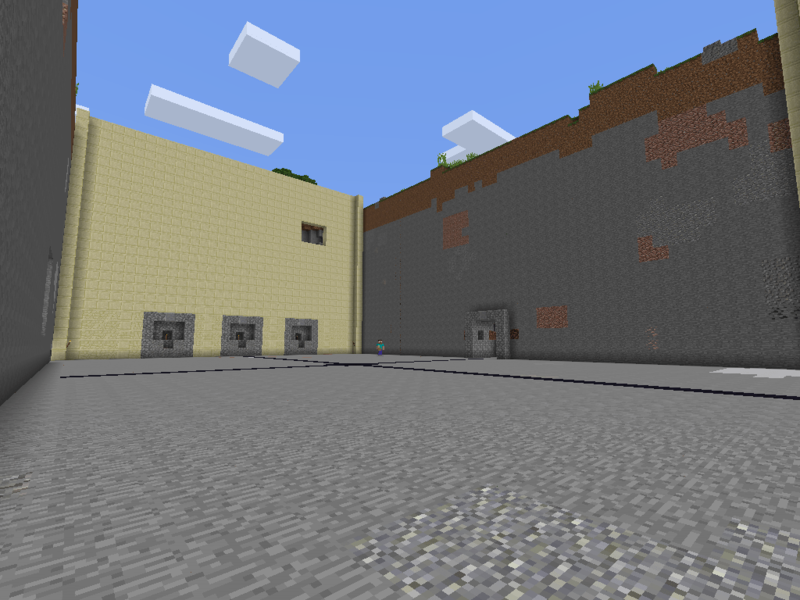 One wall up to the surface and 3 bellmouths of subways future. So there are going to be 12 tracks feeding into here altogether. I highly doubt I’ll build out ALL of them, but I’ve always been more ambitious than practical. 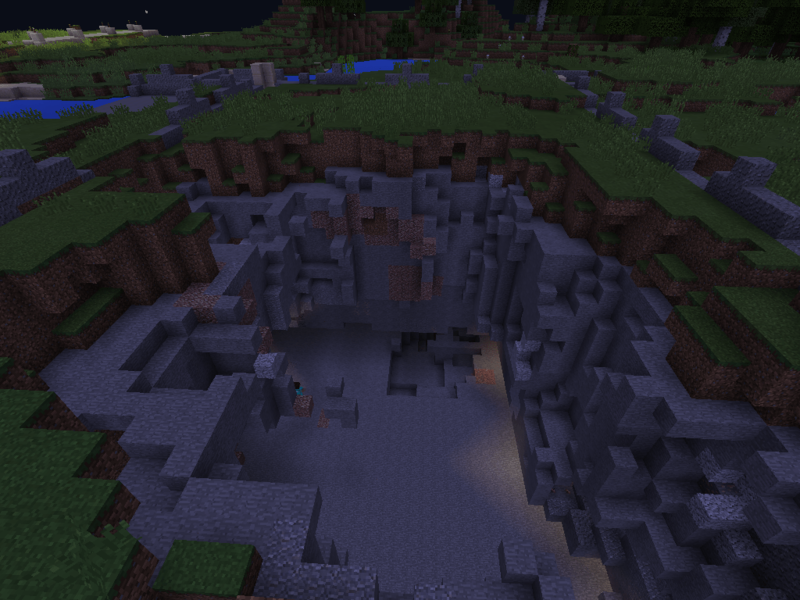 Clear crater. Or hole? Or something. Looking at the cleared space from above. 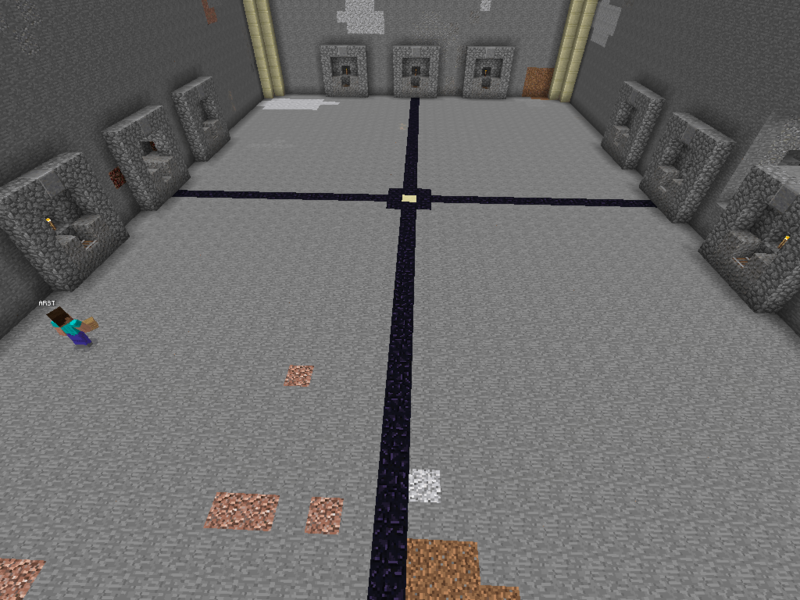 The obsidian is just for me to keep track of where the middle is. More bellmouths for additional lines. 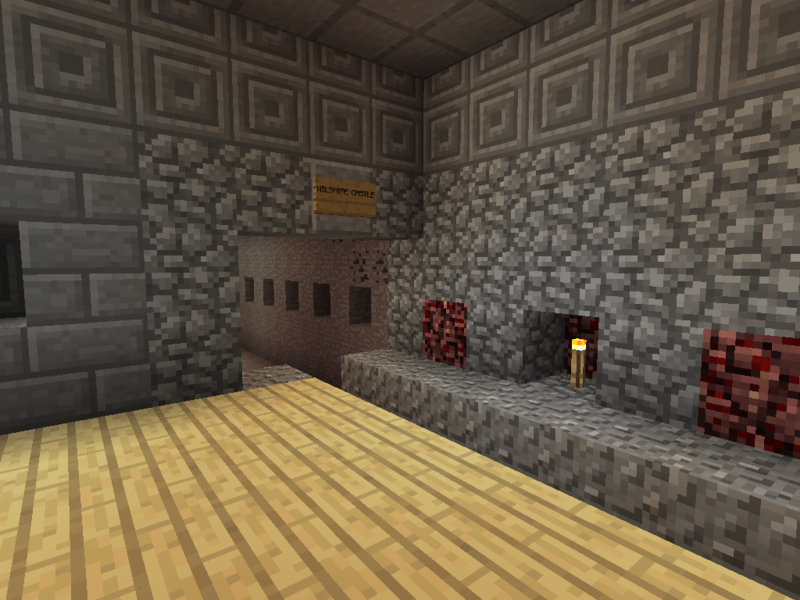 Thinking since the primary subway line had Netherrack embedded in the wall I may change that up for the other ones. 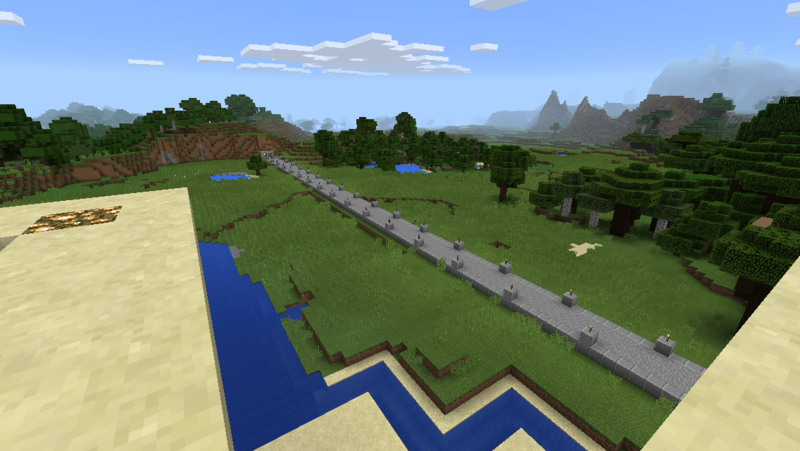 I think I want some sort of green block for the line that will eventually go east/west. Or hell, I always end up with more lapis than I ever know what to do with, maybe I’ll just make it the blue line. We’ll see. Finished the floor, bellmouths and track stubs. Makes an interesting light pattern. 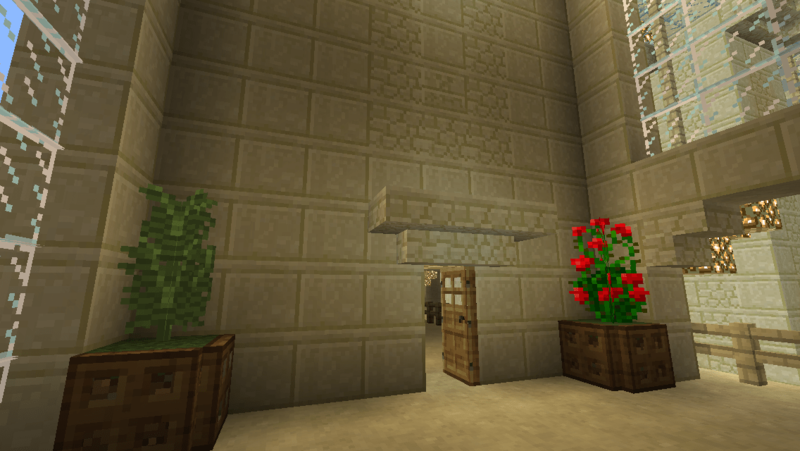 I’m pretty happy with how the wall patterning came out here. That’s all I’ve done so far, but it’s going really well and I remain really psyched about this. 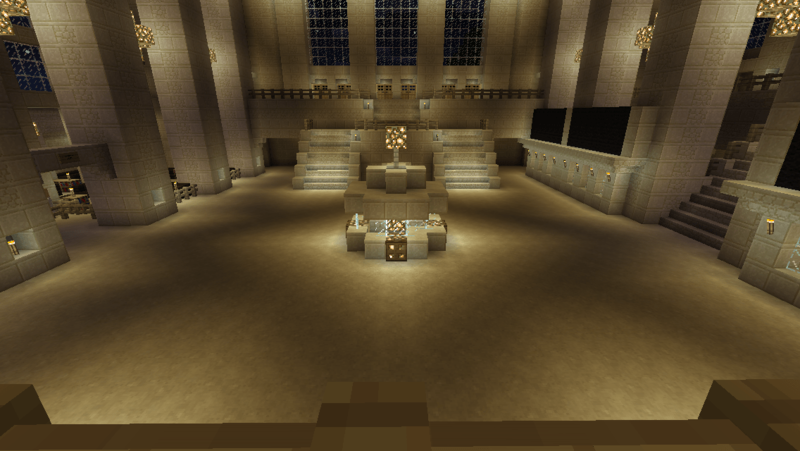 There will be more work in progress updates to come… can’t wait to get the mezzanine done so I can get cracking on the grand hall. 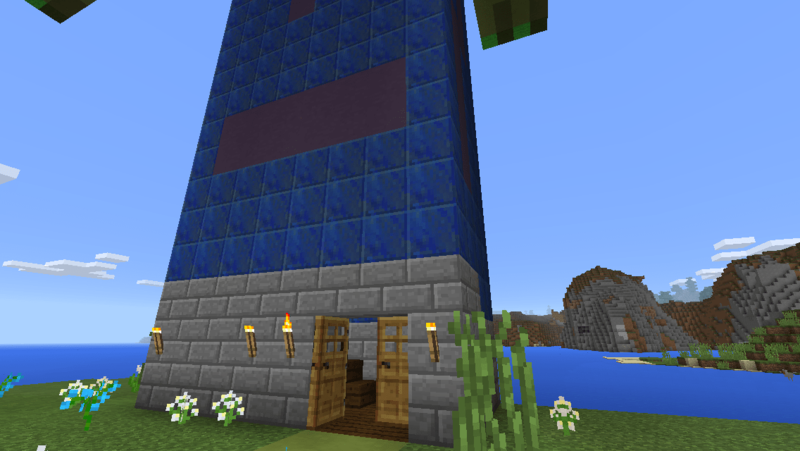 One of my MCPE builds on Fisher Price® My First Creative World™ was a giant zombie. 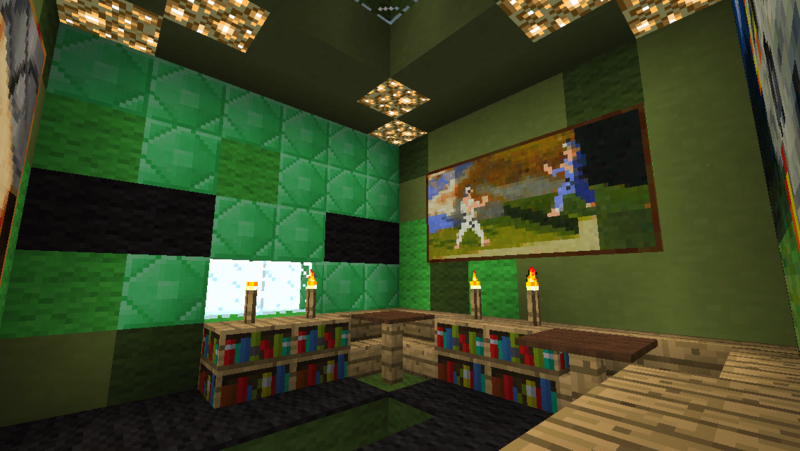 It was a challenge figuring out what color blocks to use, and working around the fact that unlike skins, blocks have the same texture on all four sides. 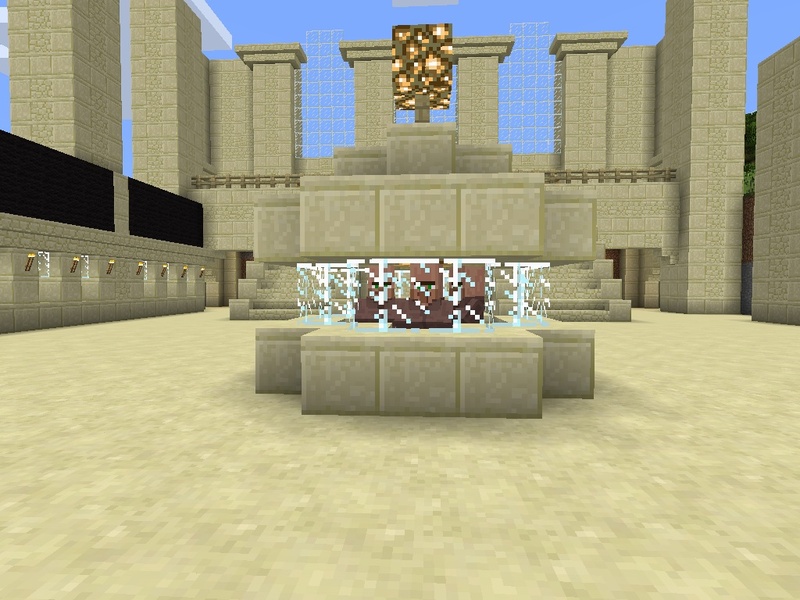 But the statue got built with the necessary fudging of detail and it lurked on one side of several incarnations of my scavenger hunt world, at least until in some of them, Wee Beastie TNT’ed them to the ground. ‘Cause, you know, Giant Zombie. Fast forward to my infinite world, and a pretty patch of shoreline and a small island out from the mainland, and I thought, what the heck, I’ll rebuild the Giant Zombie. And then I thought, nah. I’ll build FOUR of them. Get all Lord of the Ringsy. So I squared off and expanded the island and built these four colossal gentlemen quietly menacing onlookers in each direction. Though it’s really hard to menace anything with hordes of chickens sprouting out of your feet. balconies and doors connect the four. A view out of an arm. There were stairs going down too. 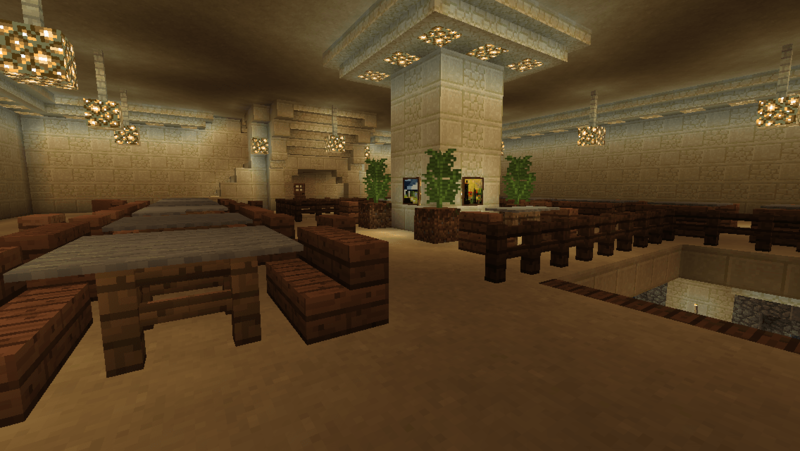 This was actually the first subway station I built on the north/south line. 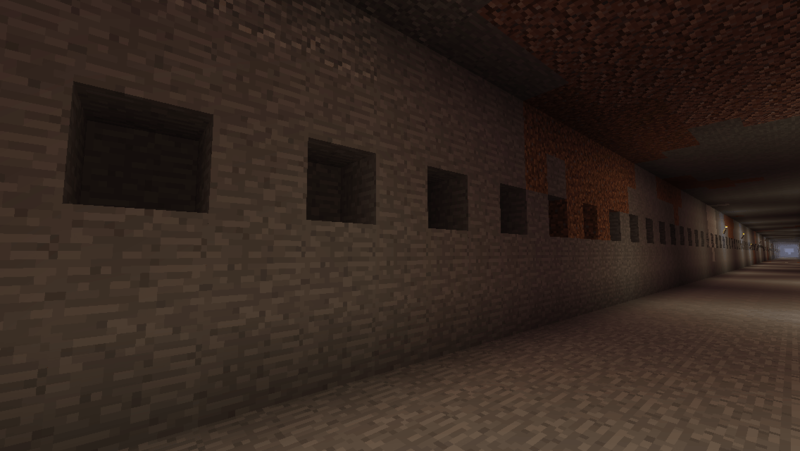 (When I add more, it’s gonna be called the Netherrack line.) 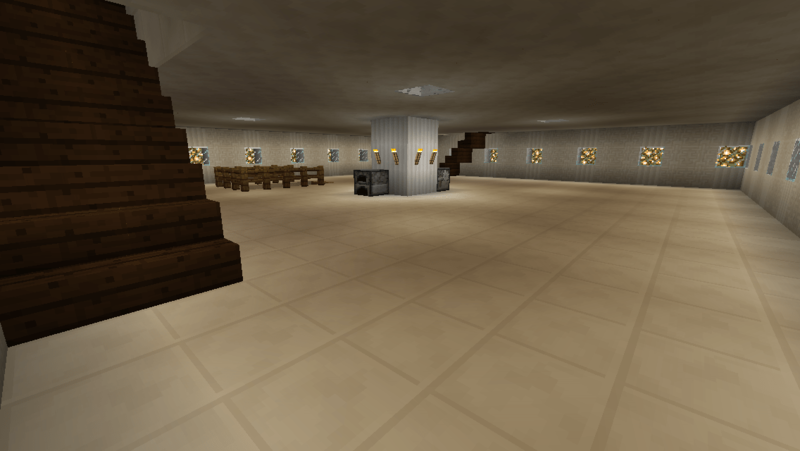 It’s a little smaller than subsequent stations, since I was still figuring things out, and the only one with stairs on the platform instead of in a space behind the wall. 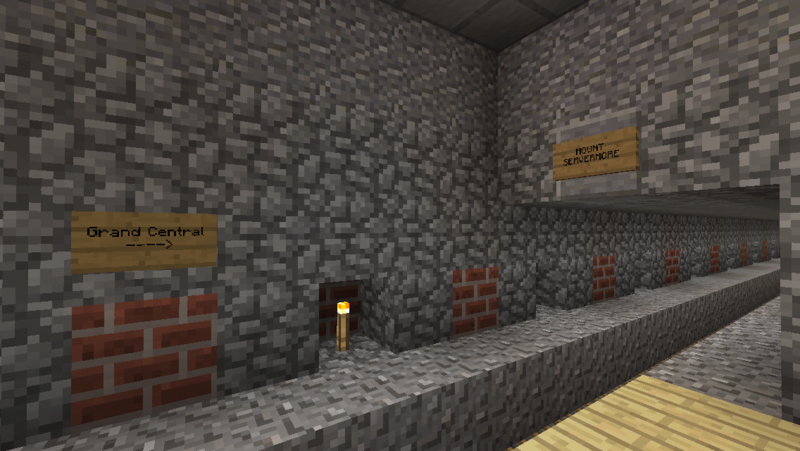 The rest of the stations got more standardized over time, but this one gets to be quirky because it was first. 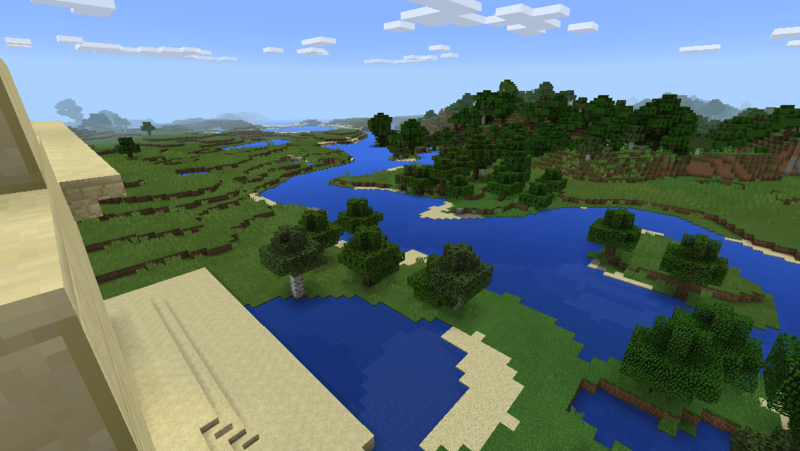 Not pictured – I should have gotten a picture of the island from the sky during a creative run, because the water around these guys? FILLED with chickens. There is a circle of flapping white specks around the island. 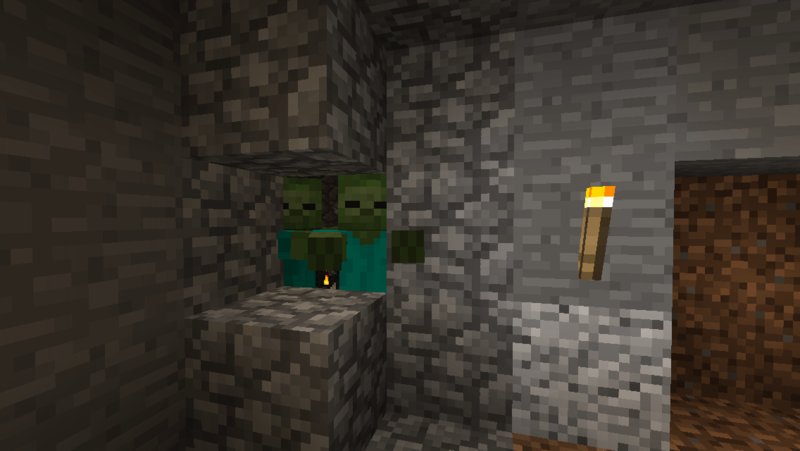 Yes, there’s a spawner somewhere. 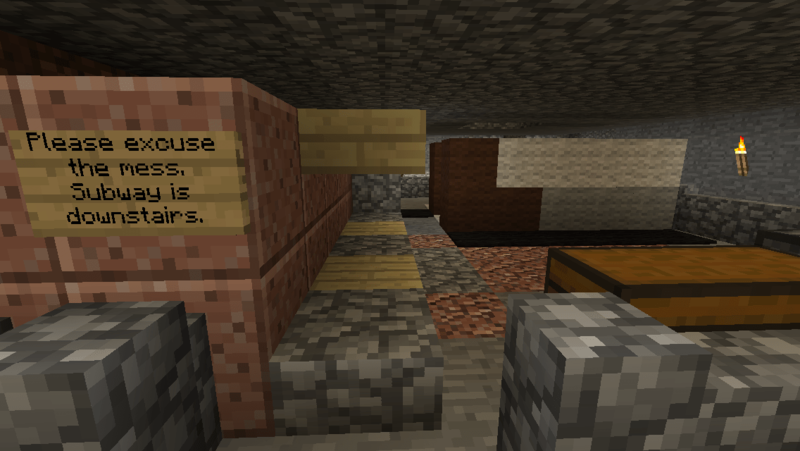 Occasionally they get down into the subway and hop a minecart. 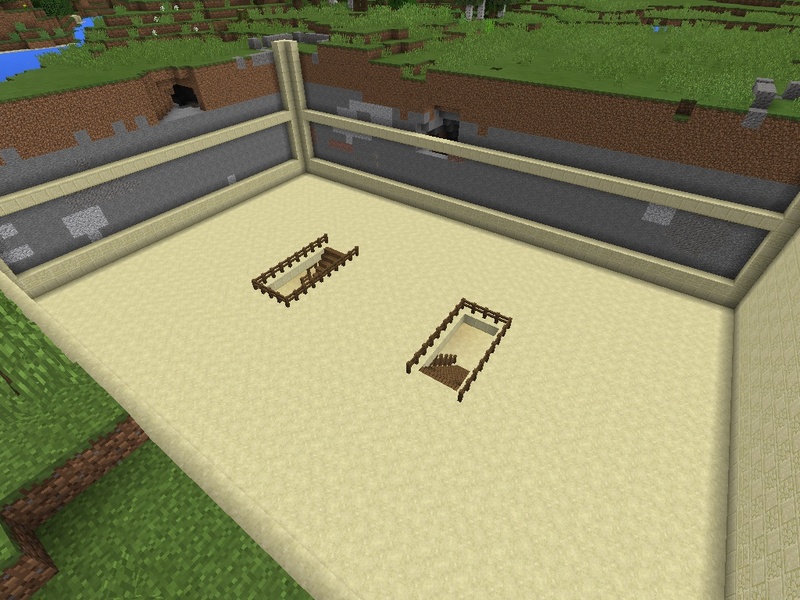 Chickens in minecarts are way funnier than they ought to be. And thusly ends the tale of the four. Also these guys have since acquired names. They are Icky, Stinky, Yucky and Clyde. Don’t ask me which one’s which. First open MCPE server run! 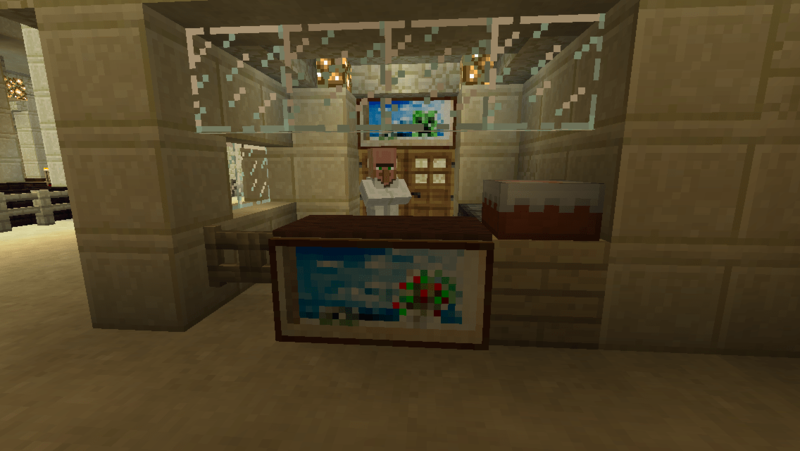 Well, after getting the domain and port forwarding right and figuring out FINALLY how to switch the main world back to Survival (I’ll post a tutorial on both later), I posted a “hey my world’s open, come visit!” notice on /r/MCPE this evening. I wasn’t expecting too many visitors – hell, I would have been happy if one person showed up. Happily I had four, and to those four, especially /u/Palcto and /u/EclipseSun, I say thank you for making my first MCPE server run pretty epic. Sadly the allotted 3h of game was cut a little short by an incoming call from the husband (note to self, Plug PE does NOT play nice with phone calls). Such is the hazard of running a server on one’s iPhone. But still I’d say a pretty successful first run and I’ll definitely be doing it again. I am frankly flabbergasted that it took two hours into a 2.5ish hour run for the game to crash. Between the general bugginess of MCPE especially with Plug PE going, and the unreliability of my net connection lately (sigh *COMCAST*) I was expecting the game to be yo-yoing way more than it did. Nope. Pretty smooth and stable. 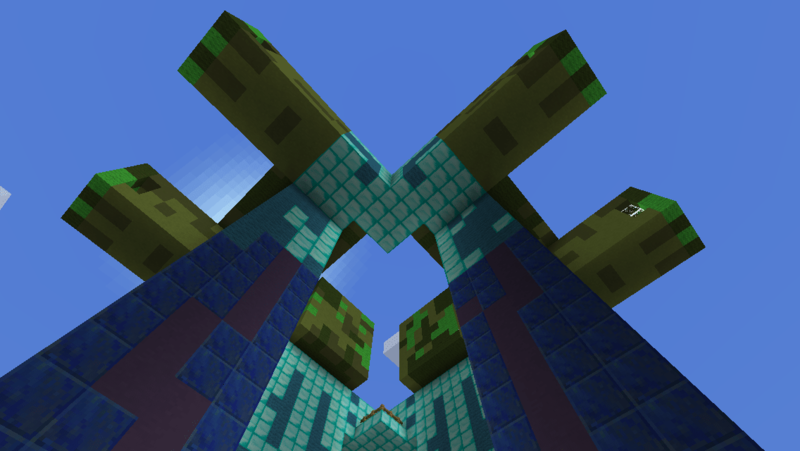 We only seemed to have problems when teleporting players with laggier connections around, making them fall through a not-loaded-yet world. Oops. It apparently takes about 2.5 hours to see almost everything in the main world. Palcto found just about everything (I suspect the Hellfire Library was missed, as it’s a little off the beaten path and possibly the maze under the castle). Something for next time then. 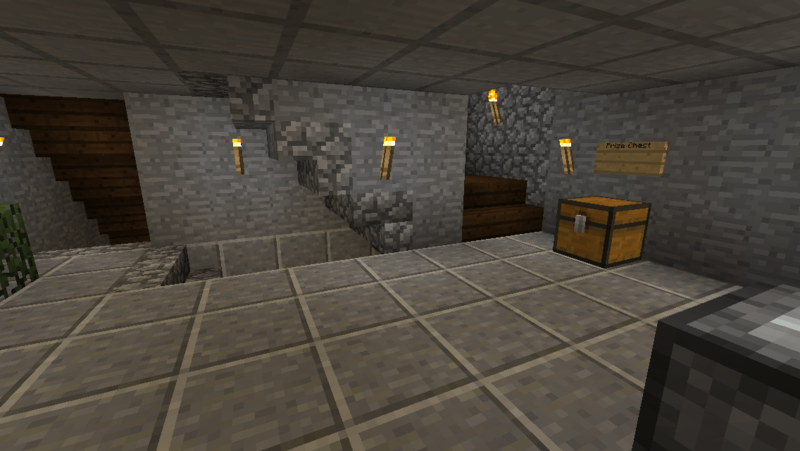 It’s been so long since I’ve run/played this world in survival that I’ve not only forgotten what’s in all the chests everywhere (answer: lots of good stuff still) but I’d forgotten to do things like leave minecarts in the subway stations for folks to use. Whoops. 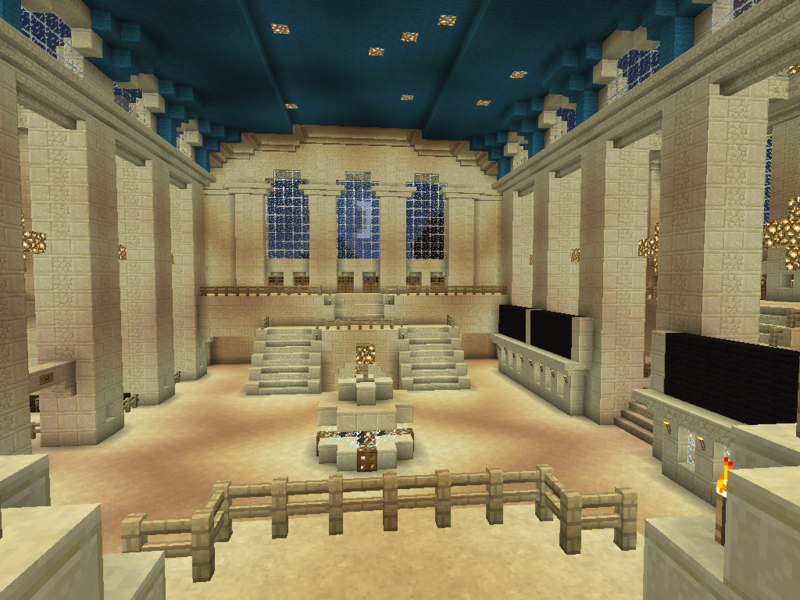 EclipseSun has a different shader pack, so I asked him to post the screenshots he took, and holy crap, some of the builds look amazing in it. 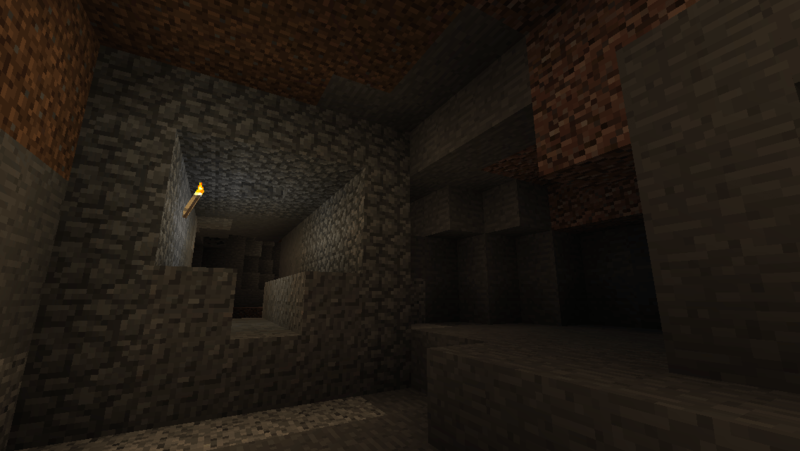 Palcto also took screenshots of his adventures. EclipseSun finds some giant zombies. A pretty sunset and a glimpse of the subway running underwater. 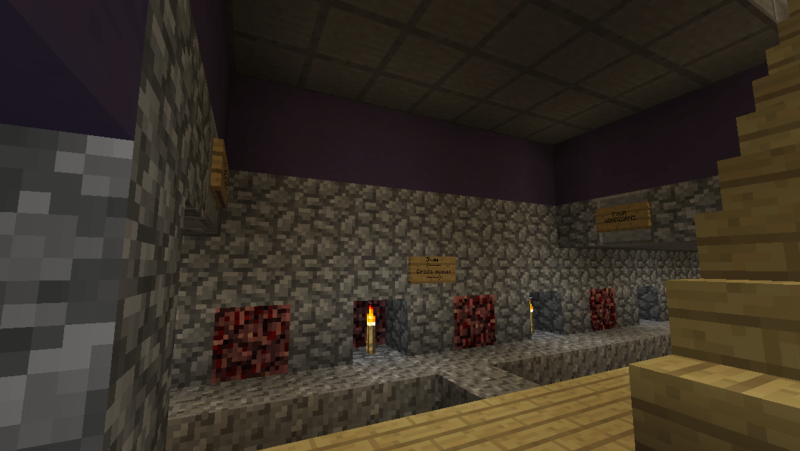 The subway looks really cool in EclipseSun’s shader/texture pack. 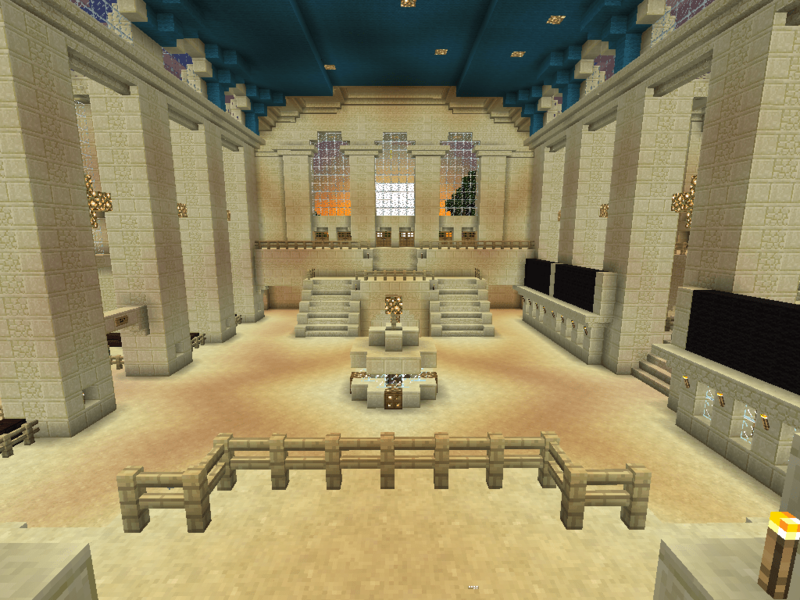 Looking back toward Spawn House. EclipseSun needs an apple. All Hail the God Of Mutton! WOW. 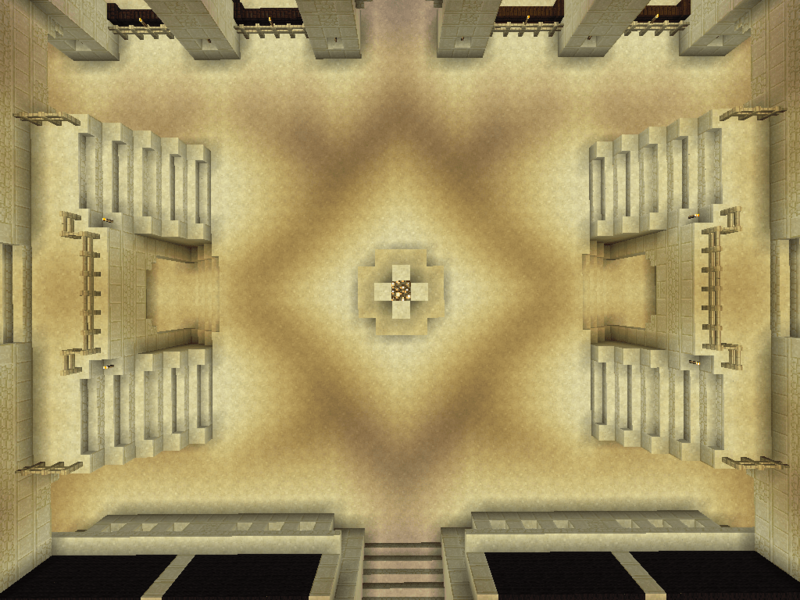 Sand Baori also looks awesome. So going back exactly 8 months ago to late evening, July 18, 2014. 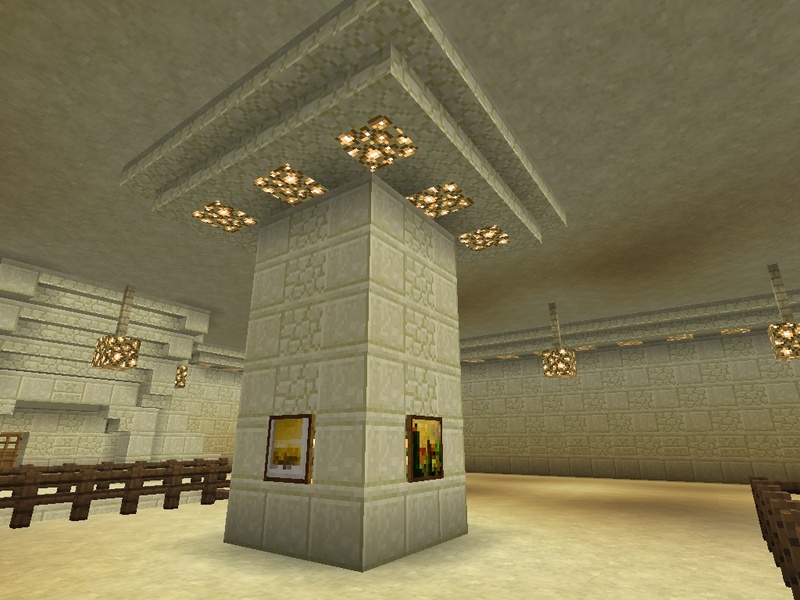 The new update to Minecraft had just dropped for iOS and I was terribly excited. 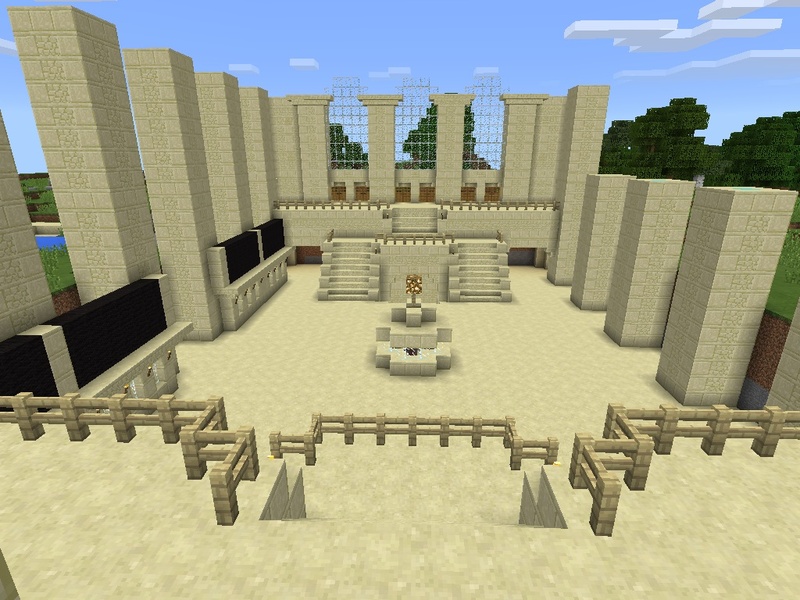 Since I’ve never been a PC player (and have no real interest in starting), this was going to be my first time experiencing infinite worlds, Enderman, biomes, wolves and several other things Kidzilla and Beastie liked to tell me about during their visits. …and the image in the header appeared before me. Immediately I noticed how different everything looked from my last world. Grass everywhere. A deep river type thing stretching lazily in front of me to who even knows where. A dense copse of trees ahead, some of which looked very different from what I’d previously seen. If I squinted I could even see a mushroom off to the right. They’d been nearly nonexistent in my previous game. Best of all was looking ahead to that tree line and knowing behind it stretched a huge world waiting to be explored. (Interestingly though, I haven’t made too much of a foray westward as yet. Most of my explorations since have been to the North). 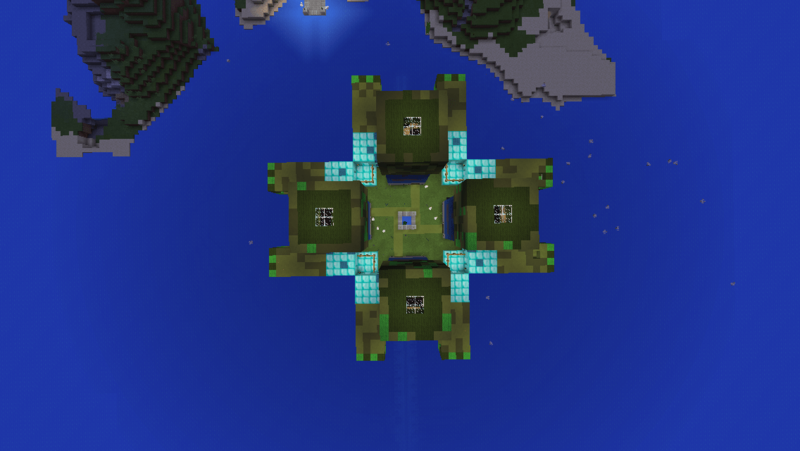 It being Survival mode though, I wanted to make a shelter before sundown. Like you do. So I made a 90 turn and started exploring the nearby landscape for a place to dig in and roost. A good spot to start a home. 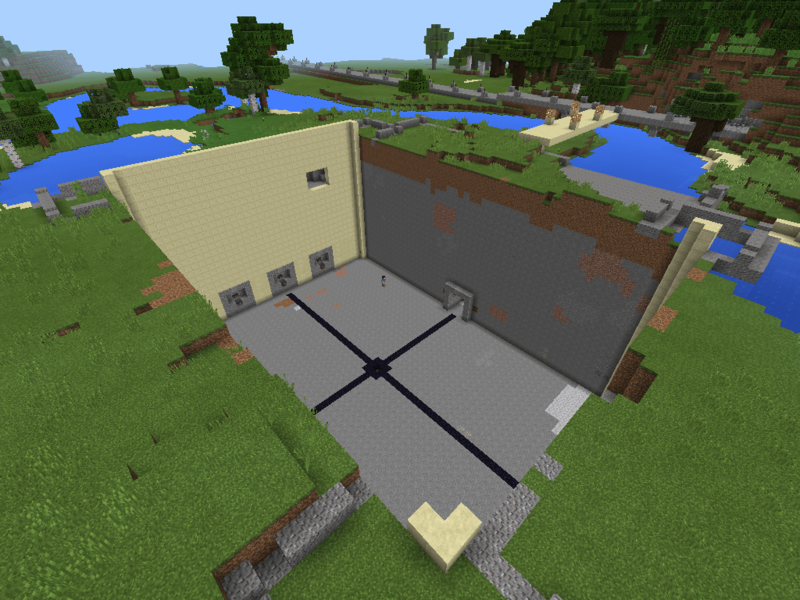 Spawn House has gotten a bit more… developed since. 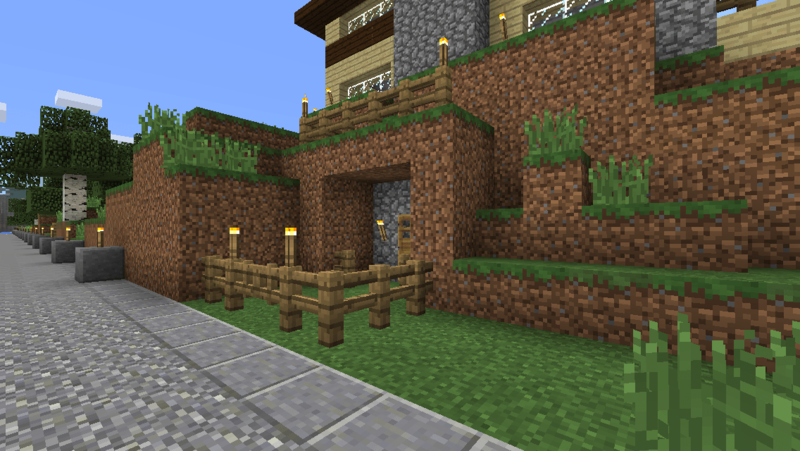 Ground entrance to Spawn House. That’s the same spot, roughly the same angle too. My, how the neighborhood has changed. 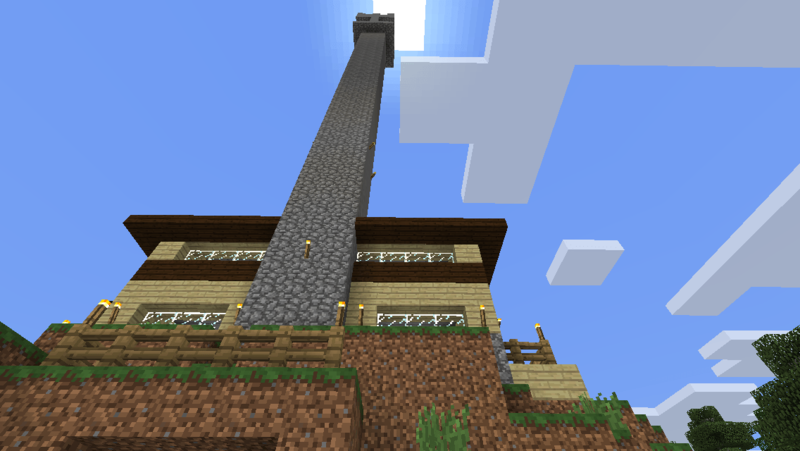 What looks like a chimney off the left actually has a ladder going all the way up to the top of the tower. We’ll get up there in a sec. It got way more fun being up here once I tinkered with my options.txt file. The view from up here as a result is pretty amazing. Northwest Roads and… stuff! We’ll visit sometime. Looking to the Northeast. Haven’t seen much that way. Southwest view. Haven’t explored much in that direction. Back ooking northeast from the tower after the sun has set. 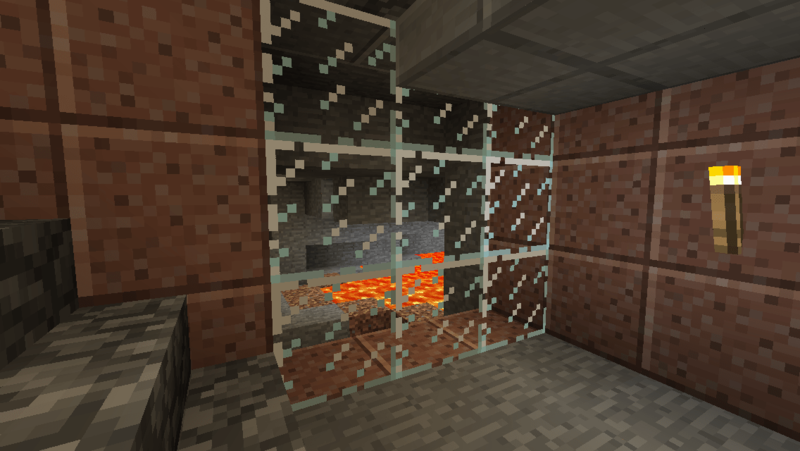 I’ll probably have explain why there is a burnt out field of flaming netherrack covered in lava in another post. 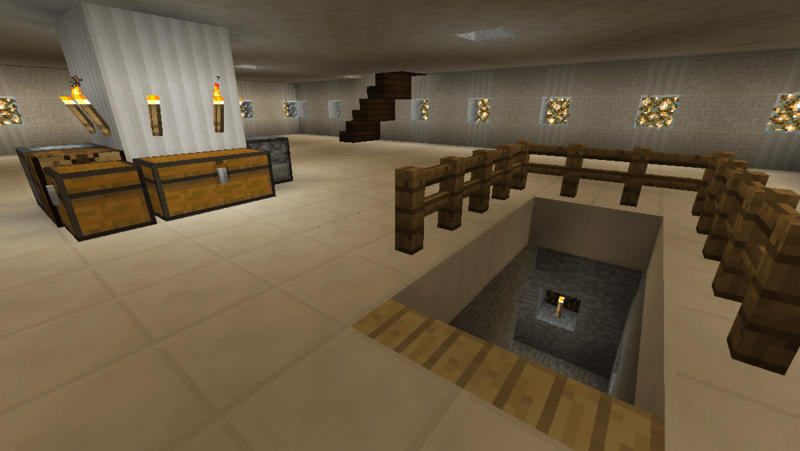 Anyway, enough ogling the scenery, lets look around in the basement(s)! I guess this is the ground level? 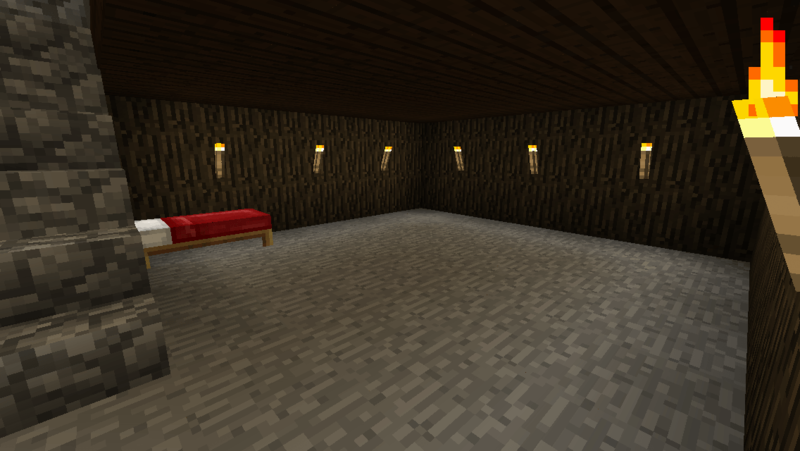 This is the first room I carved out in the house. Because punching rocks. 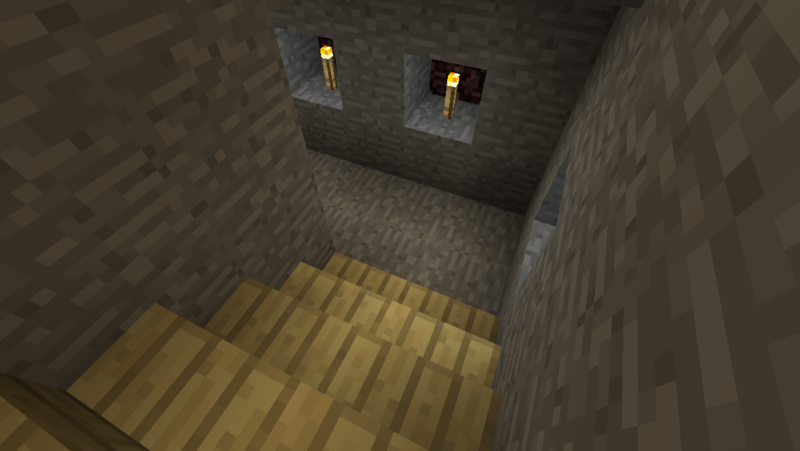 Fun fact – I’ve set those dark oak stairs on fire a couple times by mistake. 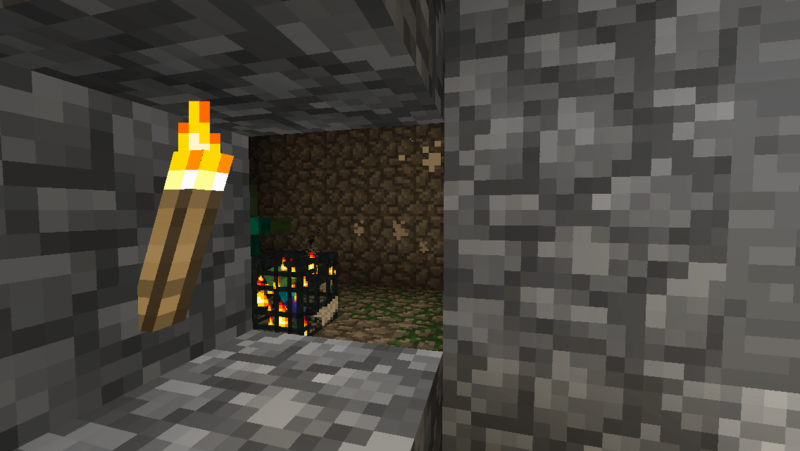 I didn’t know then that even if there’s a solid barrier of cobblestone containing lava, it can still set surrounding wood on fire. Oops. Actually I’ve burned down the entire spawn house at least once during construction that way, which is why that chimney isn’t actually a chimney. 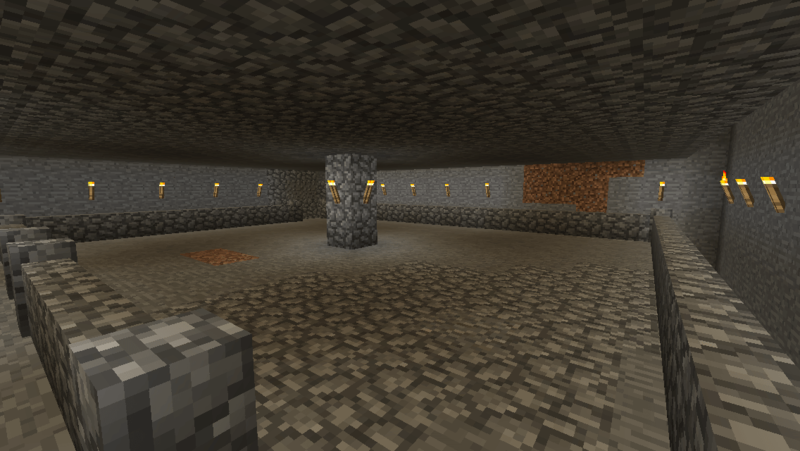 Got a lava pit you don’t know what to do with? 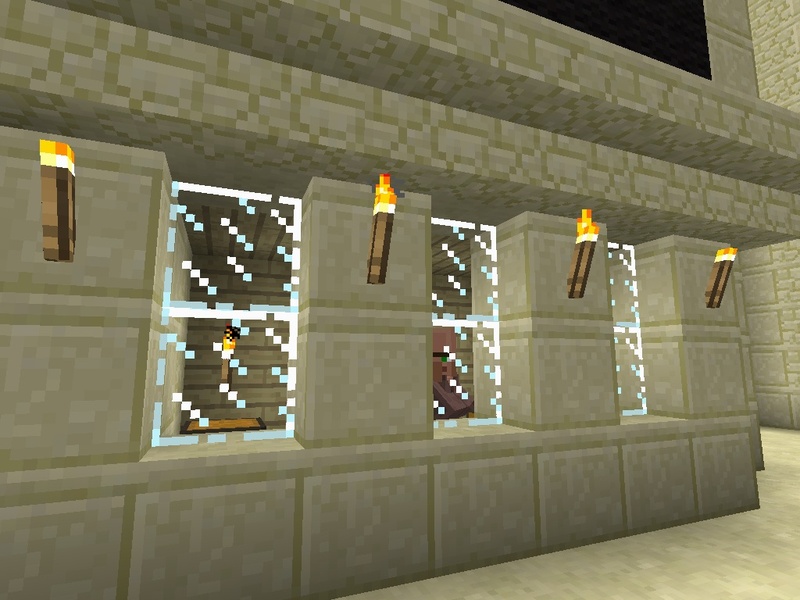 build a window and make it part of the decor! I don’t even know what the kids did down here, the level is kinda trashed, hence the sign apologizing for the mess. I think they were trying to set up super secure beds or something. 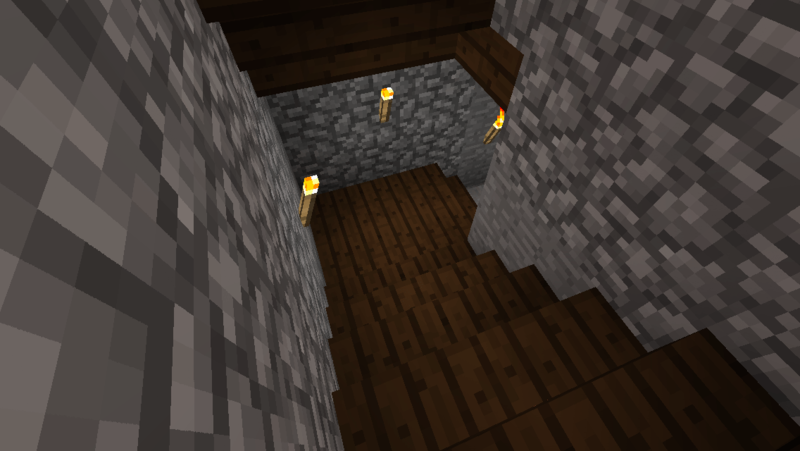 If I’m mining out a space under a house in Survival I tend to leave behind these cobblestone warrens of platforms and stairs. You can just see the platform through the doorway, but we’ll go out there another day. 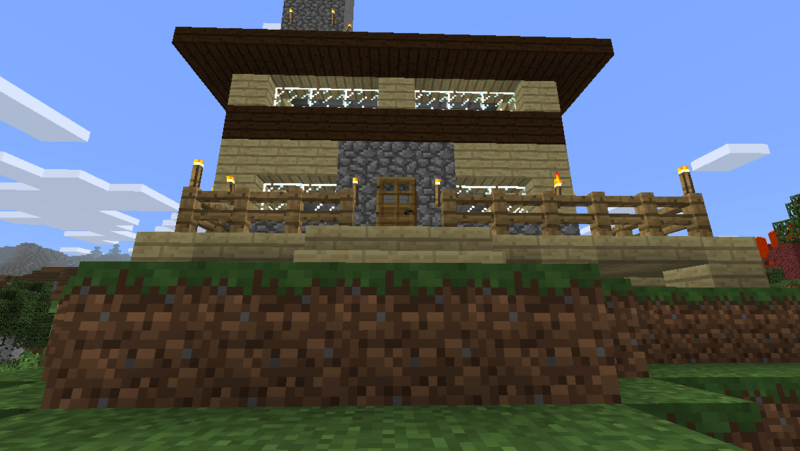 So there you are, my first house in this world. Go big and go home, right?